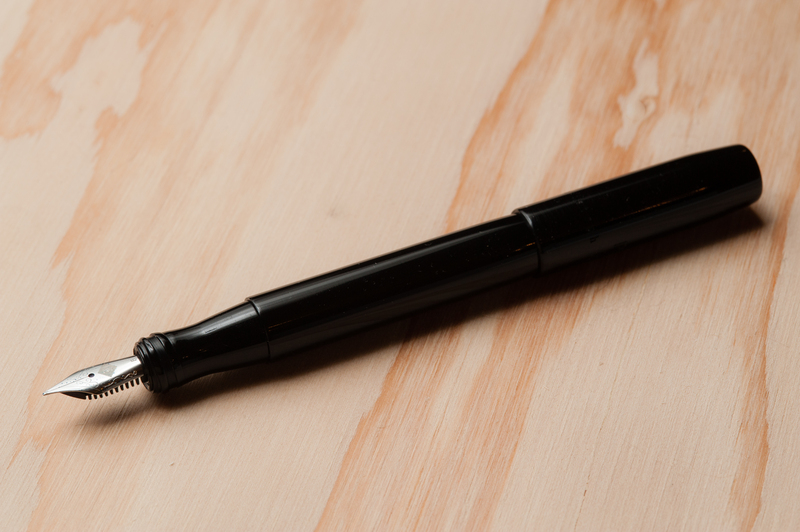 Katherine: I love the shape of this pen — it’s so clean and well proportioned. My one gripe, as with the Pocket 20, is I don’t love the lines on the cap and at the end of the barrel. I’ve owned two Model 20s, but over time I’ve sold both. 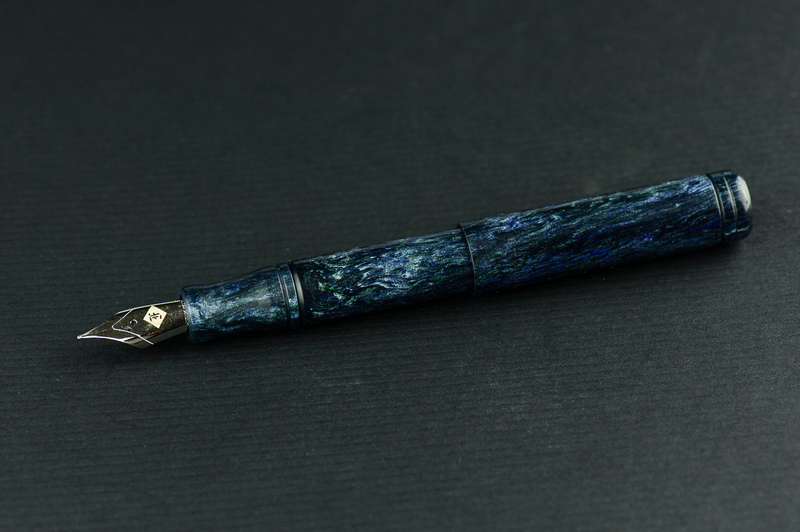 I love the frosted finishes, but the barrel is too large for me to want to eyedropper the pen (because I’ll never be able to write it dry) and they don’t look quite as nice with converters. Pam: Franklin-Christoph never disappoints. I am happy to review their classic Model 20. 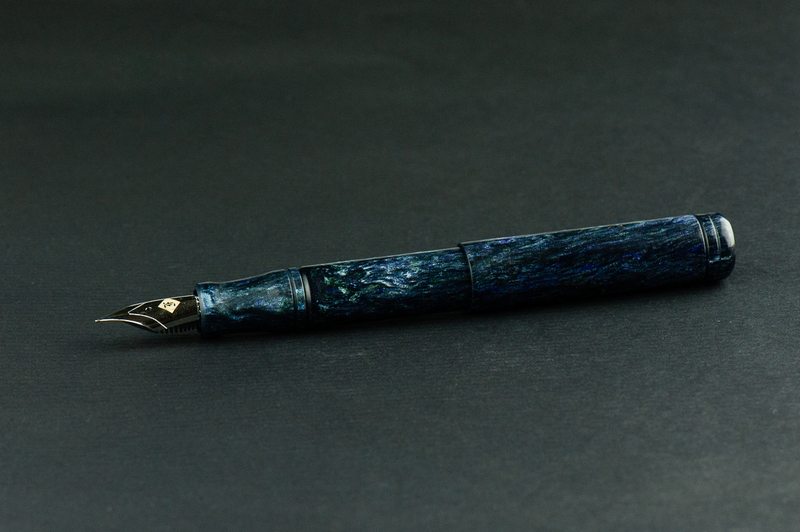 I was initially turned off by the shape of the pen when it saw it in the Ice and Antique Glass finish. In the black finish, it’s actually quite subtle and doesn’t bother me at all. One of my favorite features of this pen is the snap cap. It’s so practical for my specific use case. 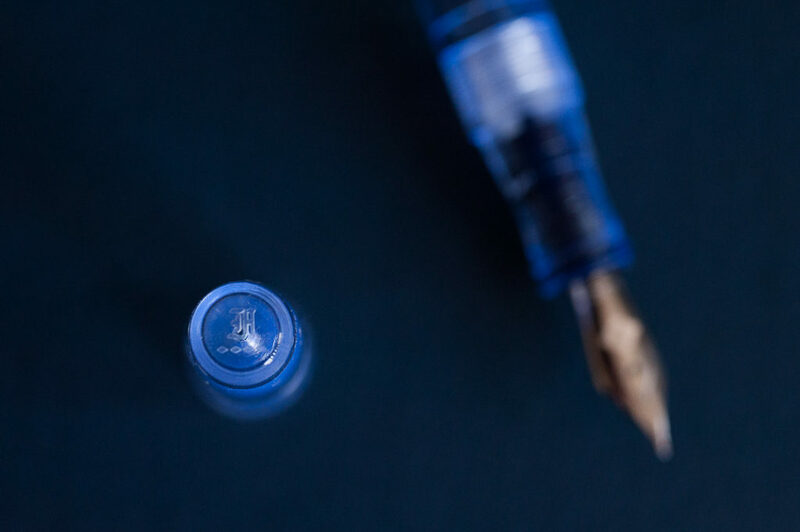 Details: Franklin-Christoph’s logo engraved on the cap’s finial, and the flat end of the barrel. 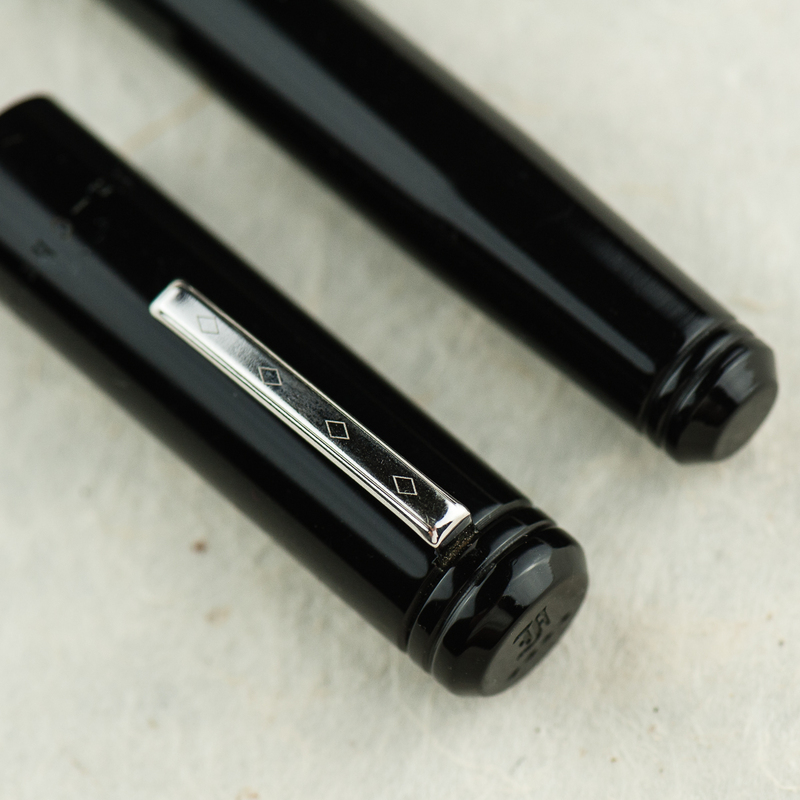 Details: Beveled ends of the cap and barrel, Franklin-Christoph’s Diamond design on the clip, and the rings designed on each end. Katherine: Yay Masuyama cursive italics! I prefer the Fine, but the Medium is similarly smooth while still be nice and crisp. Pam: The nib is a Masuyama M cursive italic that was tuned by Jim Rouse at time of purchase. The cursive italic has a small amount of bite, but nothing bothersome. It’s also the nature of a cursive italic grind to be less smooth than a typical stub grind. Like always, it’s a joy to write with and the bit of a bite is pleasant feedback. 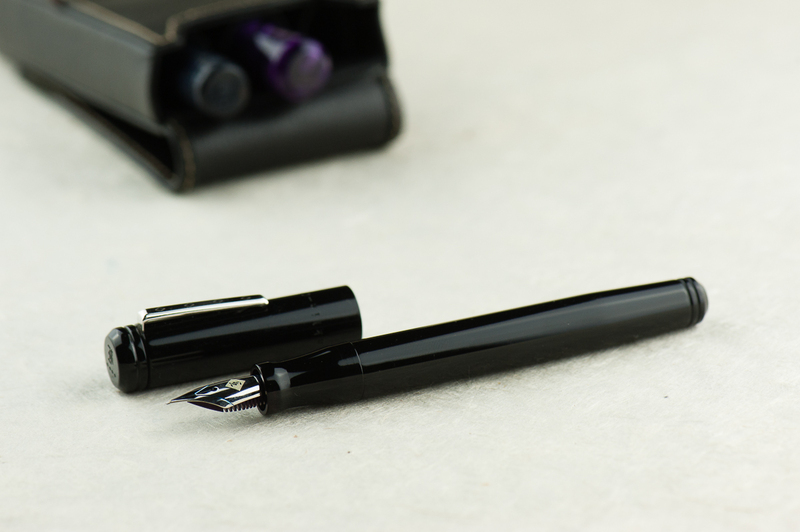 Franz: As far as I know, when Franklin-Christoph introduced the Model 20 in early 2015, it was the first recessed nib fountain pen they had. 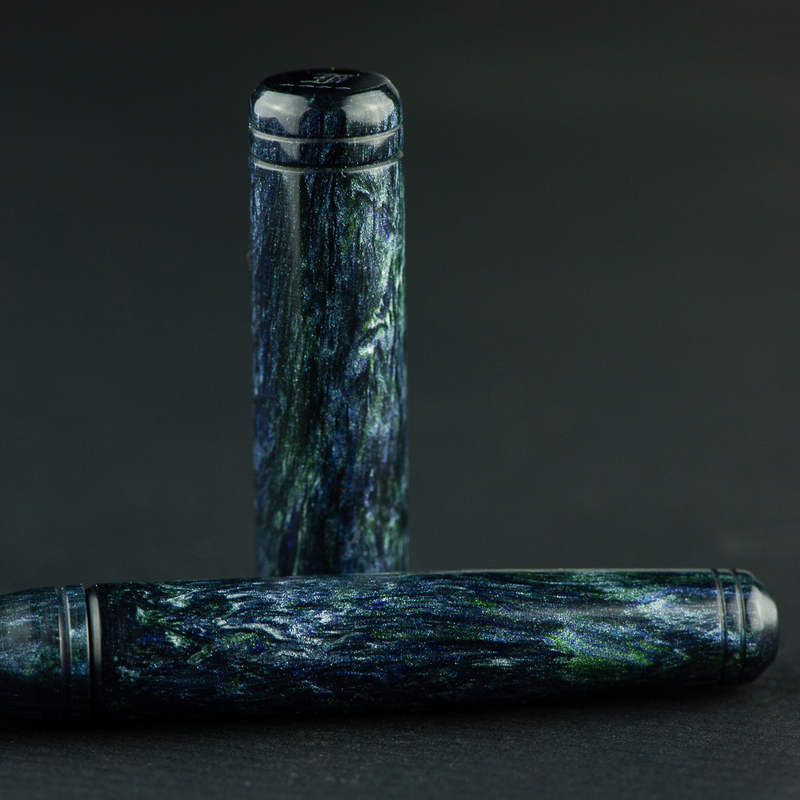 And that design alone attracted me to the Marietta at the 2015 LA Pen Show. It wasn’t sold back then but I knew I had to have one! 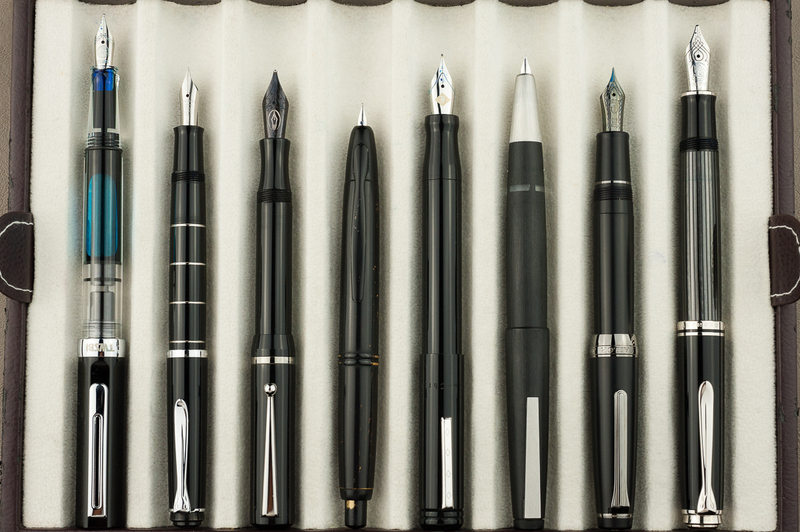 The Model 20 is fitted with a #6 size Jowo nib like most of their larger pens. This nib in particular was pre-ground to a cursive italic by Mr. Mike Masuyama and then as with all F-C pens sold, it was finally adjusted by Mr. Jim Rouse to my liking. It provides a crisp line and also quite forgiving. Katherine: This pen is definitely comfortable — it’s light and the section is a good size! I’ve definitely written page upon page with this pen, it’s unobtrusive and, paired with a nice grind, lots of fun. I highly recommend using the pen unposted for those of the smaller hand persuasion. It’s a bit top heavy when posted. Without the cap the pen is nice and light. Franz: Just like Pam, I definitely enjoyed the lack of threads on the barrel so that the pen can be held at any spot you’re comfortable with. As for myself, I was comfortable gripping either on the pinched section or the barrel itself. Also, both writing modes (posted and unposted) were very comfortable for my large paw. As a preference though, I prefer the cap posted for it gives more weight and a better balance for me. 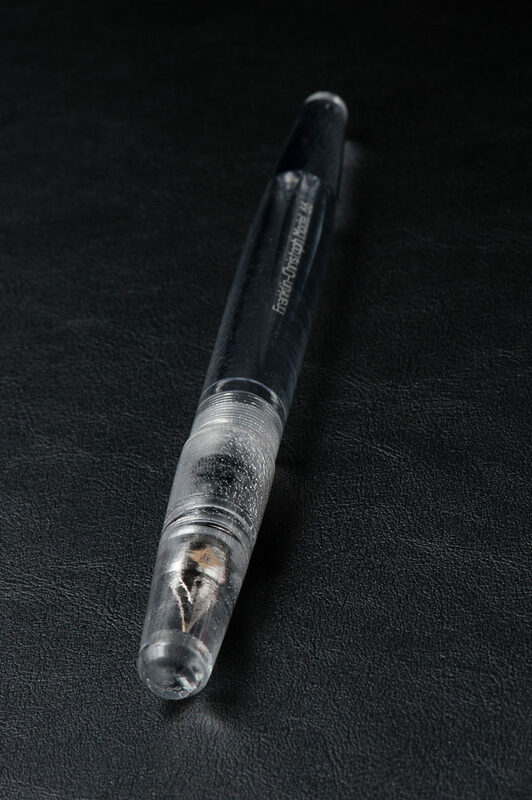 With the cap unposted, the pen seemed to be a little too light. Katherine: I’m not generally good at tightening my caps or well… remembering to close things all the way. Except the fridge. And the Model 20 is no different, but the slip cap is even more dangerous. As a desk pen, or one sandwiched in a notebook, it’s generally fine — but if I relied on the clip, I had several close calls with the body sliiiiiding away toward the floor. Yikes. It’s super convenient, but because it’s a slip, not snap cap, I have a pretty hard time telling when I’ve closed it “enough”. Pam: As mentioned previously, this pen is one of the best EDCs for me. 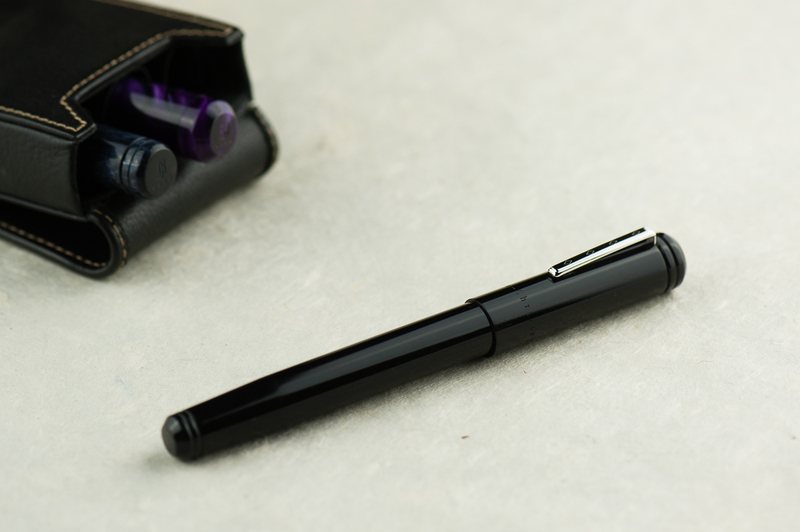 The snap cap makes this pen really easy to deploy and use for quick notes and comfortable enough for longer writing sessions. It’s a great all rounder pen for me. The clip was secure and the capping was easy. The only thing missing from the capping action is a satisfying snap like the Pilot Prera. (Insert total bias disclaimer here.) It’s hard for me to determine when the cap is securely capped but it is a snug fit and I haven’t had issues with the pen falling out into my pocket. 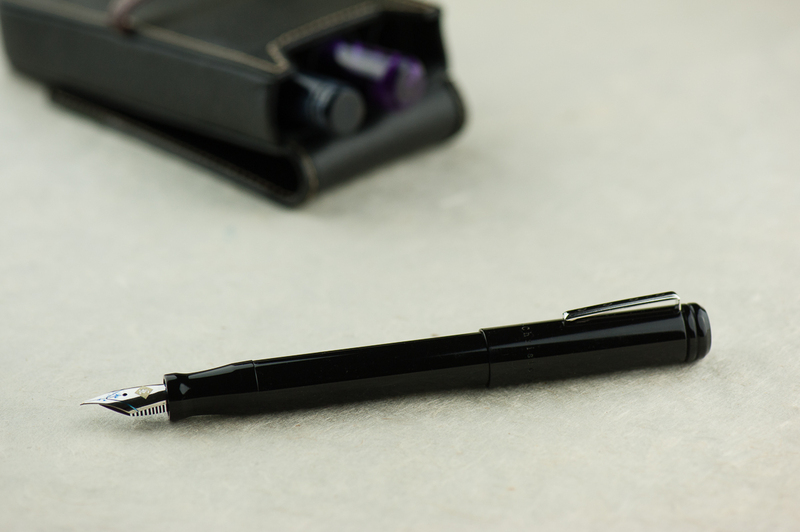 Franz: Another top reason why I was attracted to the Model 20 is its slip cap feature which makes it a perfect candidate for an every day carry pen. The two ladies’ comments about the pen not having a positive snap is very valid and was one of my issues when I first got the Marietta. However, after watching Scott Franklin’s introduction video of the Model 20, I learned a lot about how the pen was engineered. So with just a liiiiitle push, the cap secures very well. And this works in both closing the pen, and posting the cap. The lip end of the section and the tapered end of the barrel was designed to attach firmly deep inside the cap. To detach the cap, it’s easier to just use one hand. If you’d like to watch the video, link is here Model 20 Marietta Introduction. The Model 20 can be inked either via a cartridge/converter filler, or eye-droppered. I prefer using the supplied converter and it is a standard international one. One thing to note, the clip on this Model 20 is the older version and it doesn’t clip to clothing easily. I’d need to lift the clip with my fingers and slip it in my dress shirt. Franklin-Christoph changed the clip to a better functioning one so that issue is solved. Katherine: This is a pen I thought I loved, but with use found that while I certainly enjoy it, it wasn’t true love. Even then, it’s more one of those “it’s not you, it’s me” things — it’s a very solid pen that’s fairly unique in the industry, but it’s got a couple quirks that just don’t work for me (the generally super convenient slip cap and the lines on the cap and barrel). But every time I see one for sale second hand… I’m tempted, maybe the third time’s the charm? 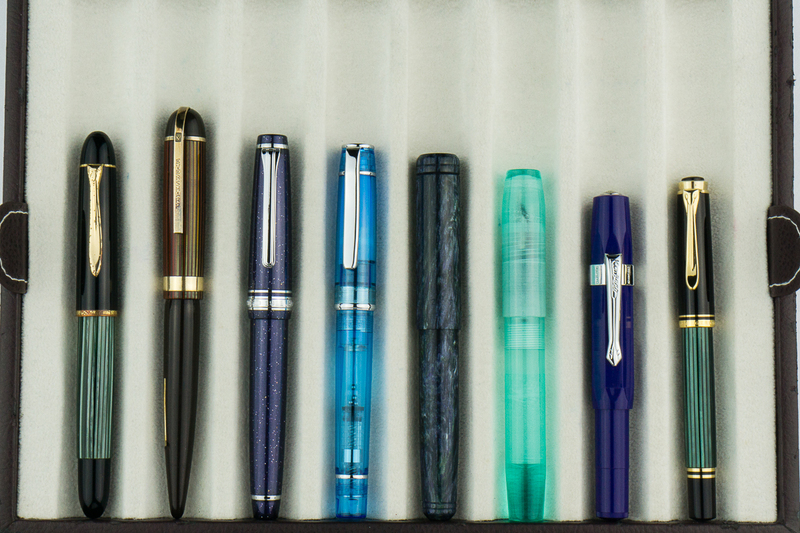 Pam: I know that I have mentioned that the Sailor Progear Slim is an “upgrade” to the Pilot Prera starter pen. 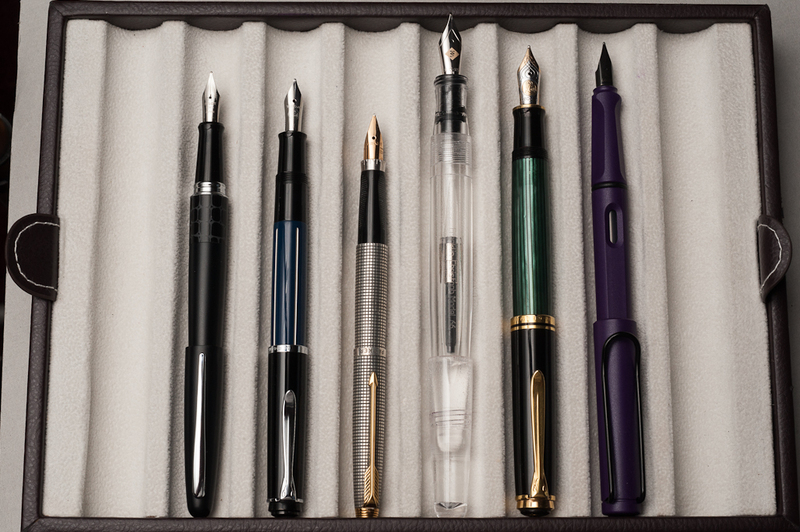 I think the pocket Model 20 and Model 20 is the Western “upgrade” to the Pilot Prera. They both are snap caps and Franklin-Christoph boasts one of the largest variety of steel and golden #6 nibs on the market for their pens. If you want a great EDC pen with a variety of different nibs that can be swapped out, the Model 20 is close to perfect. Franz: What else is there to say except to say that the Model 20 is one of my favorite pens to ink up! In the pen comparison photos below, it is very similar to a Pelikan M805 and that’s about the perfect pen size for my larger hands. The Model 20’s features check pretty much all the boxes for me. 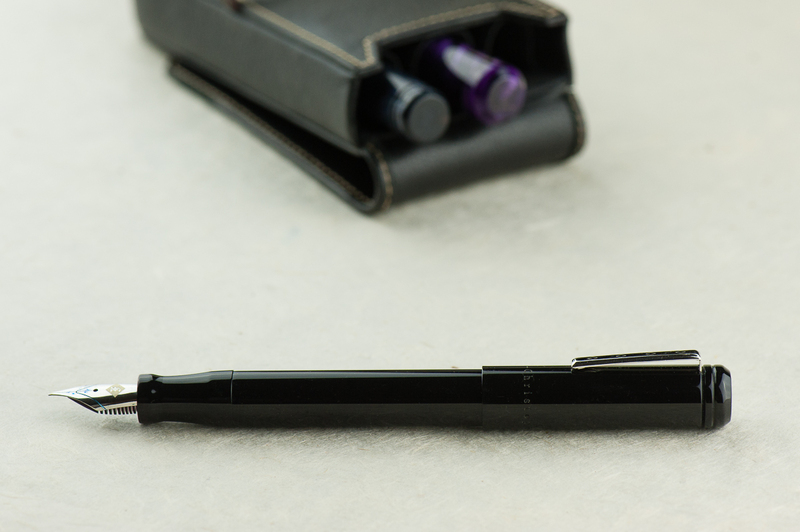 Simple aesthetic, larger size (length and girth), slip cap for quick deploy, lightweight, and a fantastic nib performance! 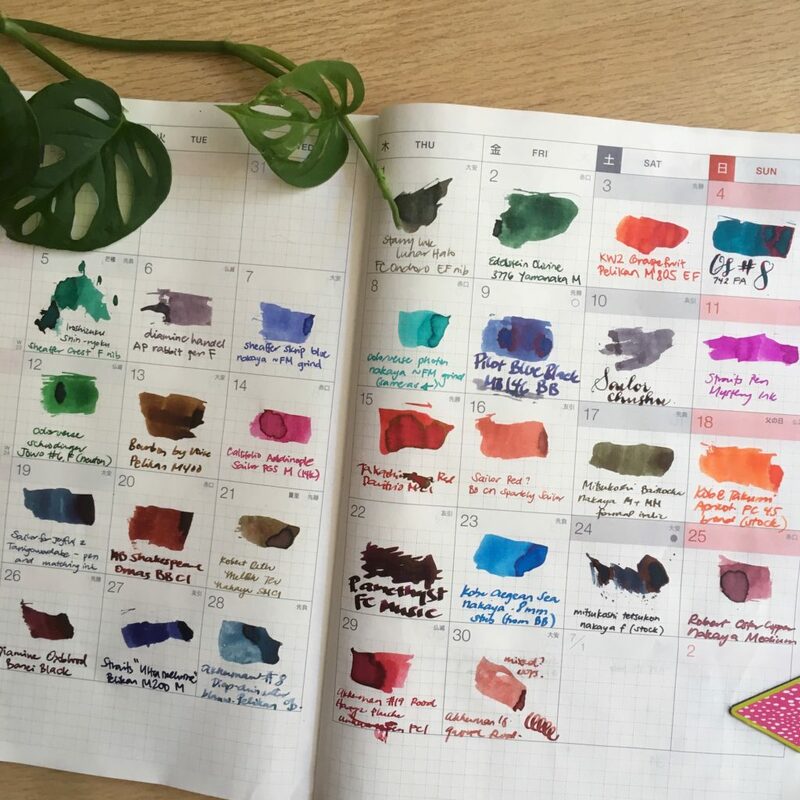 Katherine: I didn’t have a pen and ink pairing for June — I had 30! I kept up with the #30inks30days challenge on Instagram and had quite a lot of fun.I repurposed the (empty) June page from my 2017 Hobonichi to track my progress. I own more ink samples than I’d care to admit, and I had a lot of fun trying new ones and revisiting old favorites. 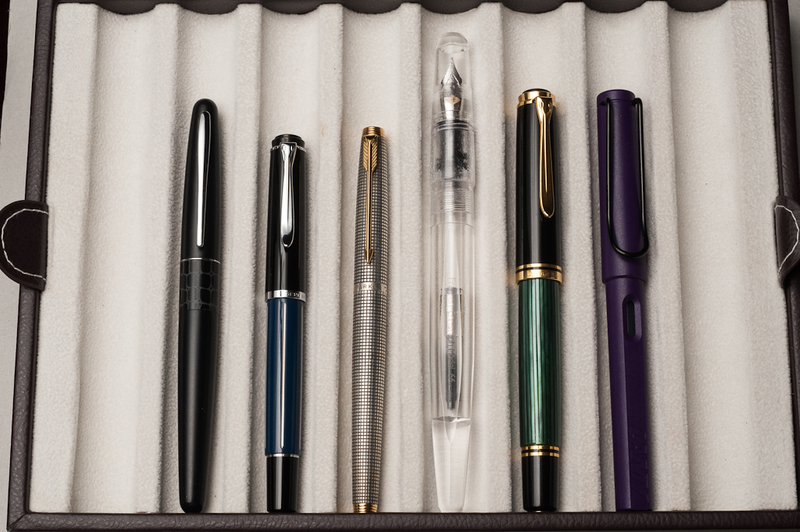 I also own more pens than I can use regularly, and this gave me a chance to get some of them inked up and writing! Pam: As luck would have it, ’tis the season to reveal an ink in my stash that I have been hoarding. It has patiently waited for a pen-mate. 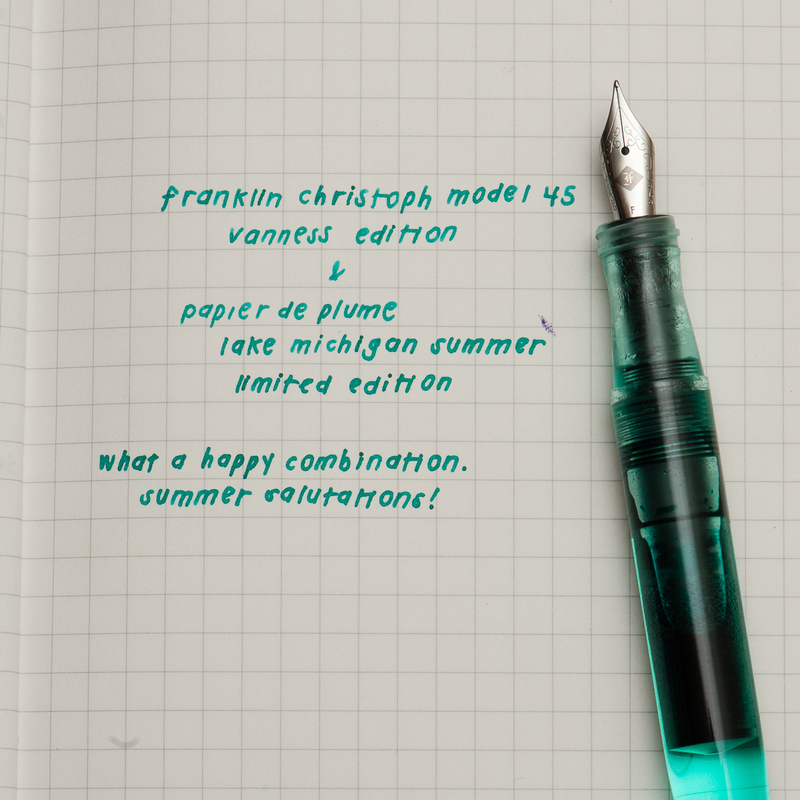 Thankfully, my minty dreams have come true with the Vanness edition of the Franklin Christoph Model 45 which is the perfect color match to Papier de Plume’s Lake Michigan Summer. 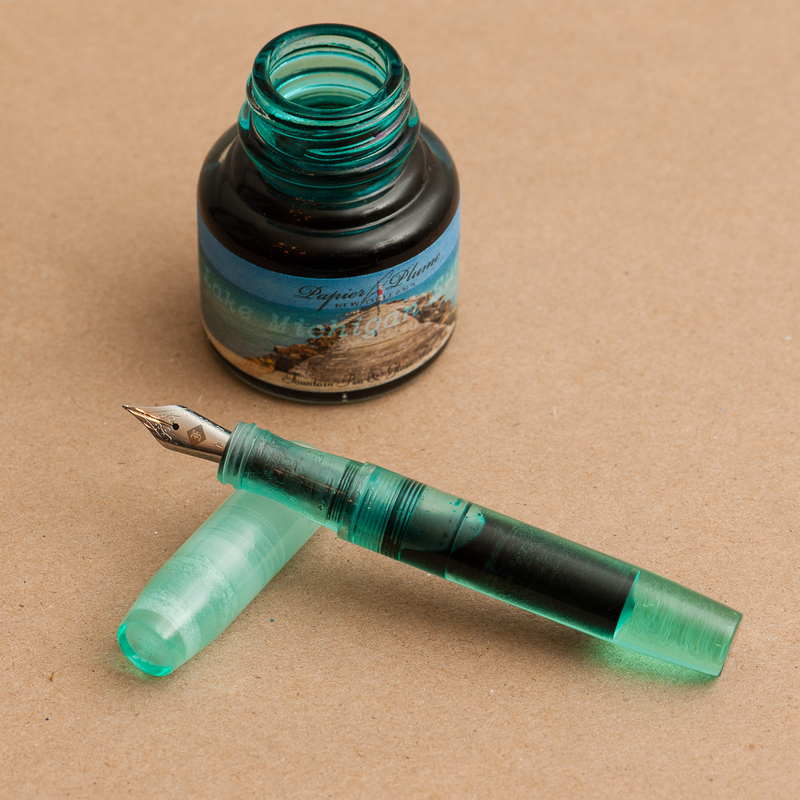 The minty color sings of happy summer days as well as the soothing waters of a lake shore in both ink and pen. I have typically avoided minty inks due to the a possible brightness that detracts from the readability of an ink. I don’t have any problem with this ink. It’s dark and well saturated to make reading a breeze. The comfort of the model 45 rivals that of my Pilot Prera which is practically a daily carry at work. Not only is the ink and pen pairing a dream come true for me; I can’t imagine a better color than the minty Vanness edition Model 45. 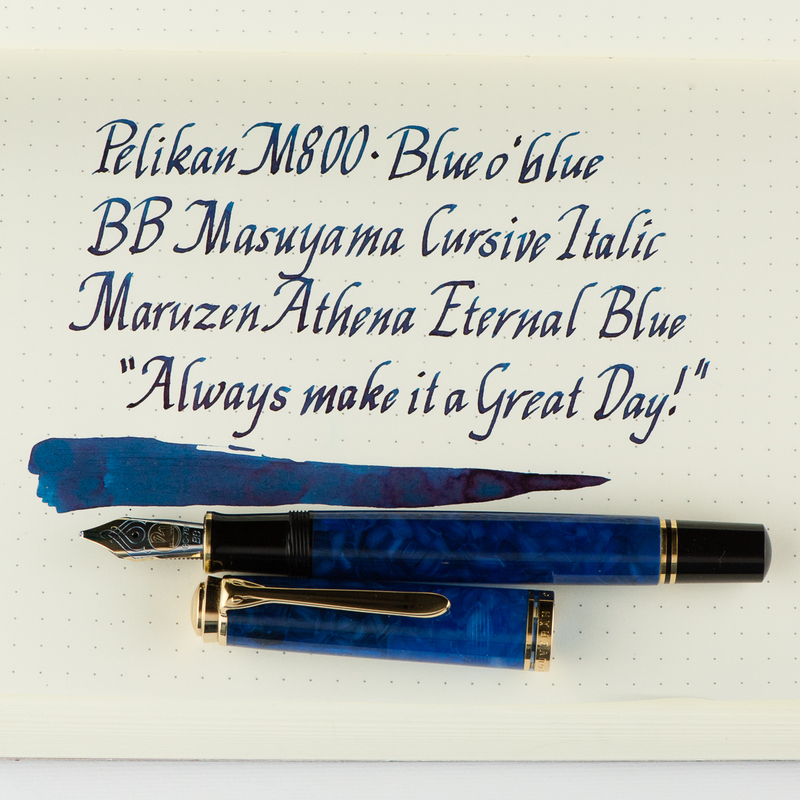 I also inked up the M800 Blue o’ blue to match with the Maruzen Athena Eternal Blue ink that I have been growing to like. 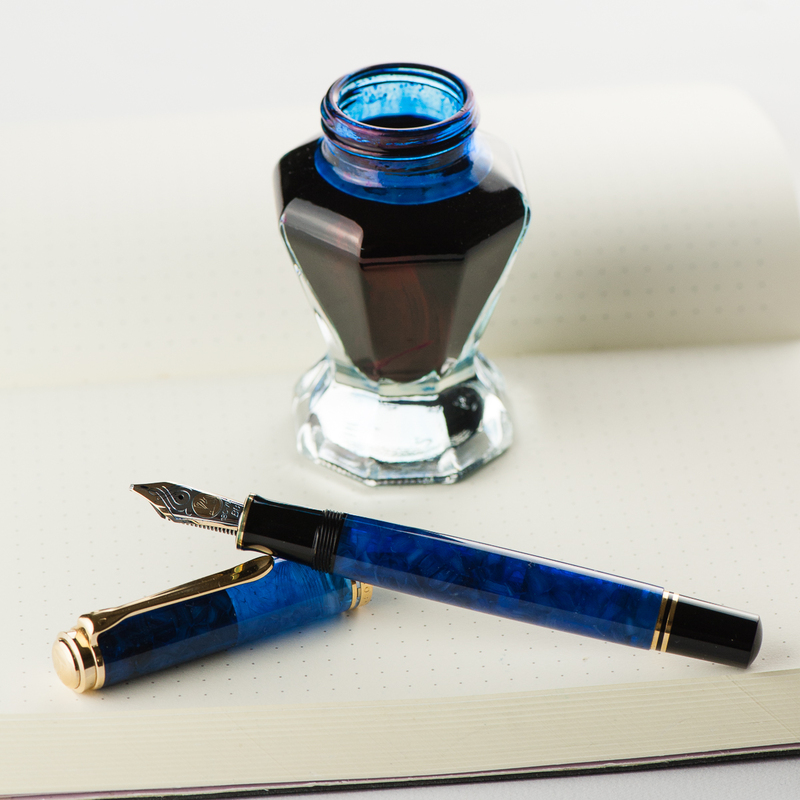 The Eternal Blue ink has shading that mimics the Blue o’ blue’s material. 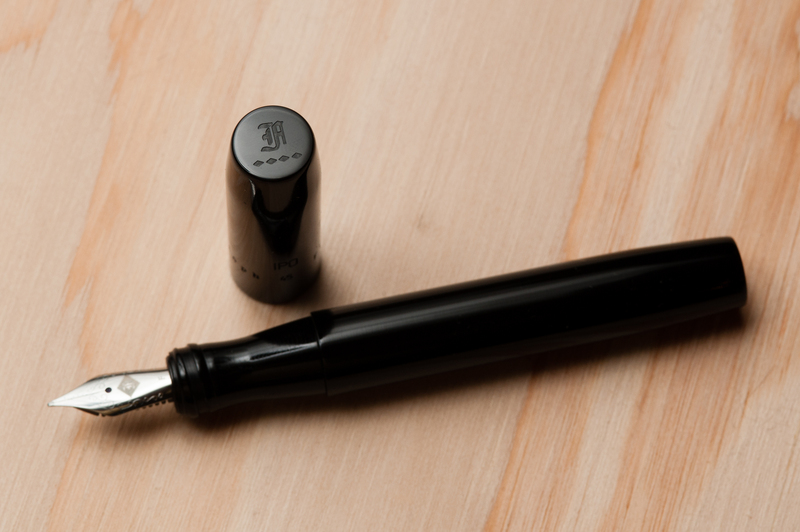 The double broad italic nib is a fitting nib for this ink because it helps bring out the shading even more. Katherine: I’m another year older and (supposedly) another year wiser this year… so I’ve chosen to celebrate with a Platinum 3776 Yamanaka, paired with Edelstein Olivine. I’ve loved the texture on the Yamanaka for a while, and was finally lucky enough to pick one up last month. It sat uninked for a couple weeks while I wanted to find it a wonderful partner (pretty uncommon for me, I usually ink things up immediately!). Franz brought over a bottle of Olivine and it seemed like a perfect match. The deep green reminds me of plants, and the textured transparent body of a terrarium — a perfect pairing for the middle of spring. 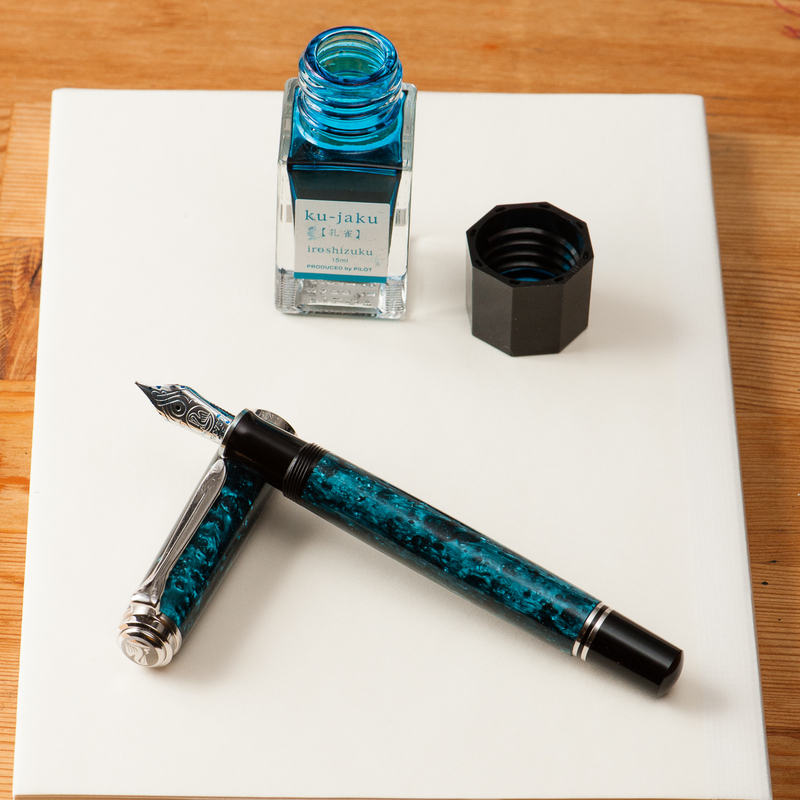 Pam: I had struggled to find the perfect ink color for Pelikan’s Ocean Swirl. The teals were either too blue or too green. I originally attempted Organic Studio’s Walden but found the flow of the Ink to be too wet for an already broad EF. My last attempt with Pilot Iroshizuku Ku-Jaku was a serendipitous hit. 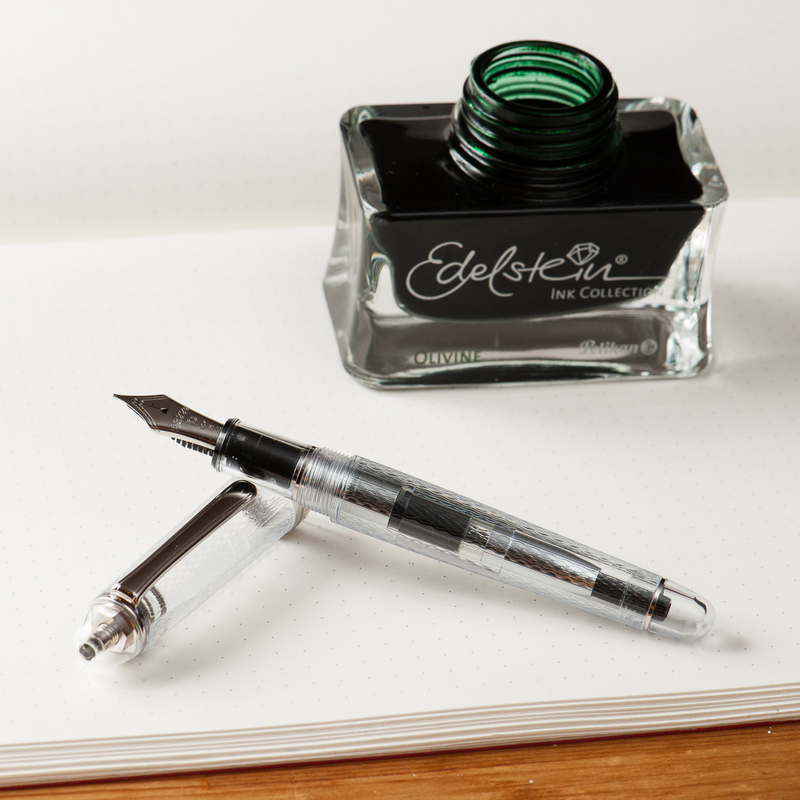 The Pelikan nib is wet enough that the ink color shines though and the line width is within the expected range of an EF. Also, like all well behaved inks, it is much faster drying with little concern for smearing in my Midori’s travelers notebook. I am glad to return to my first inky loves in the last couple of months. 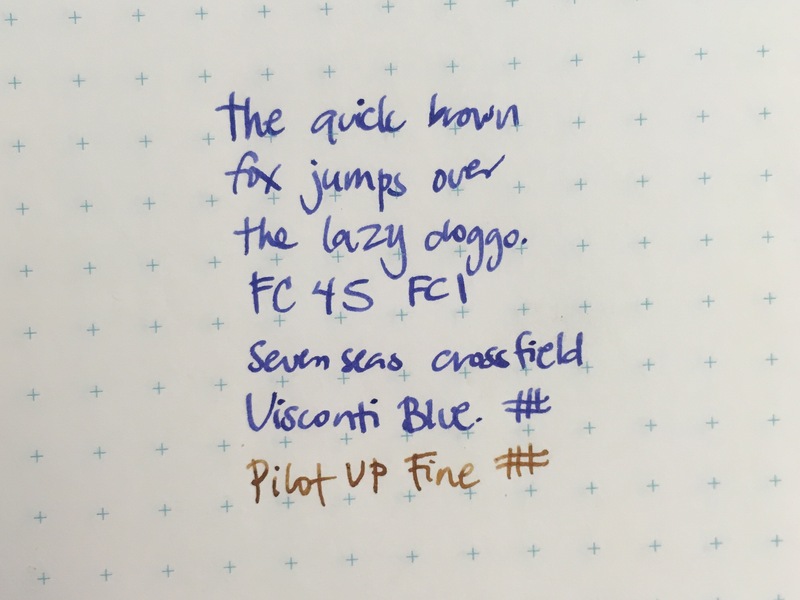 Can’t wait to try more of the “oldies but goodies.” Are there any new ink brands that are comparable to the staples like Pilot and Sailor? 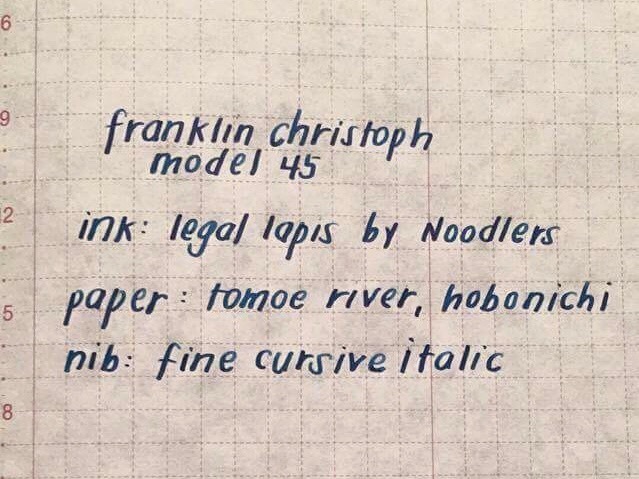 Franz: This month, I finally inked up my Franklin-Christoph Model 45 XLV Vanness Exclusive pen. The mint color of this pen really just appeals to me even if I know that it’s a small pen for my hand. But for the past couple of weeks, I’ve used the pen in conjunction with my Starbucks Philippines Weekly Planner and so far it’s a nice complement to it. I’m “trying” to be a bit more organized in scheduling tasks and events and by using this combo, it’s been enjoyable for me. In this review, we are once again joined by our friend, Roz. 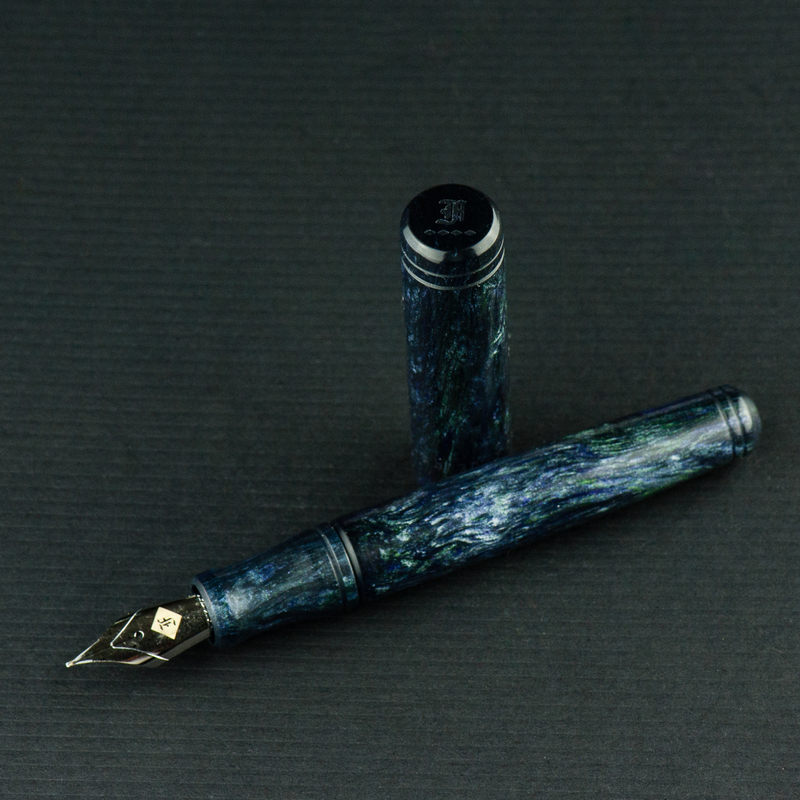 Thank you for sharing your thoughts on this pen Roz! 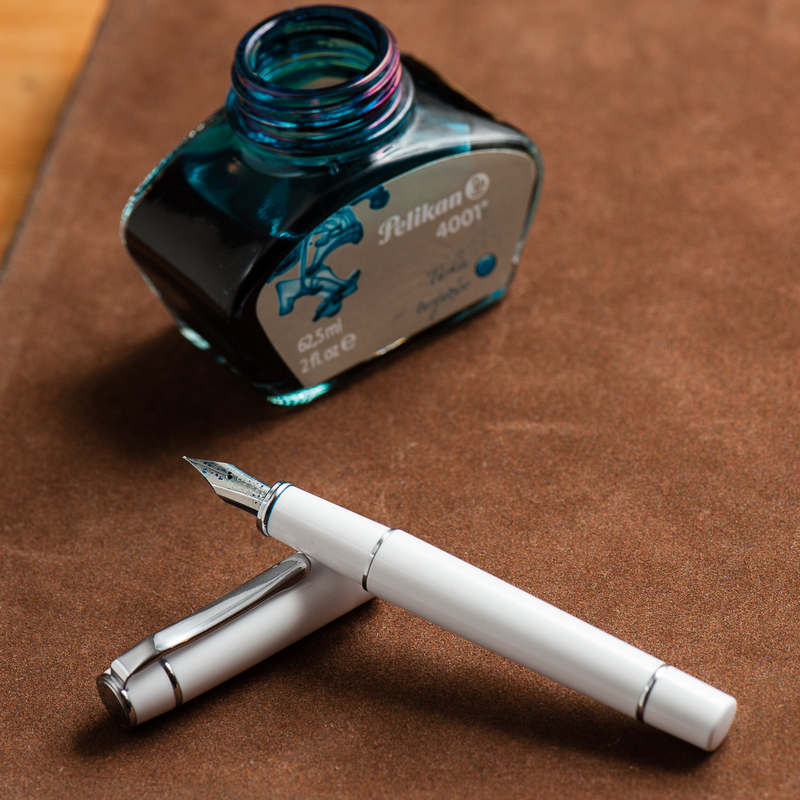 For this post, we are reviewing a color prototype finish of Franklin-Christoph’s Pocket 20 model. 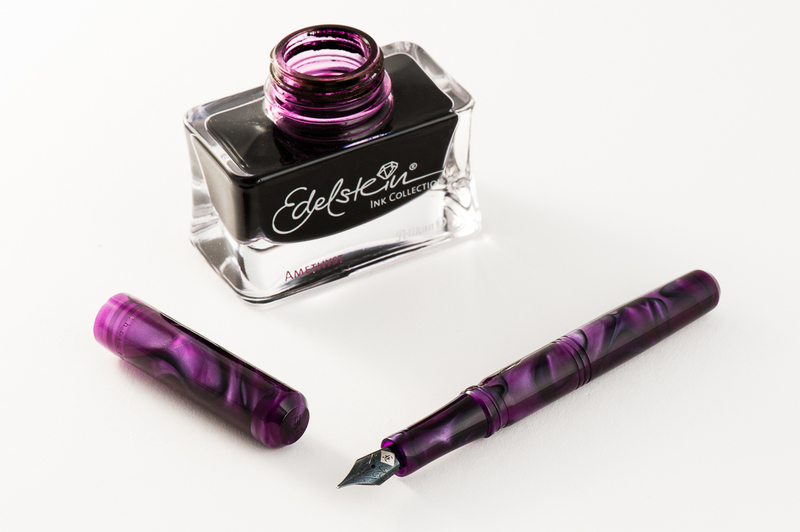 This pen was acquired at the 2016 San Francisco Pen Show and seems to be one of the first pens they made with the EPW (Emerald, Purple, White) acrylic created by Mr. Jonathon Brooks. 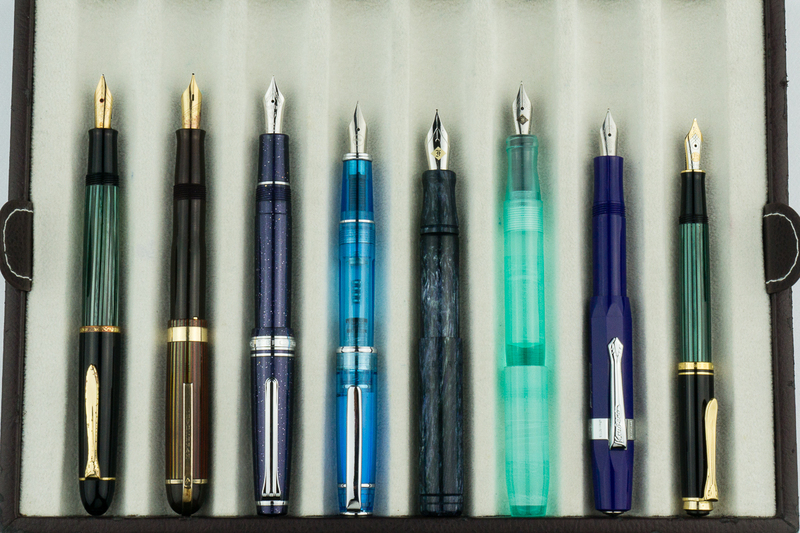 These EPW and other Brooks acrylics are seemingly used by Franklin-Christoph to produce different models in a small batch fashion and is usually only sold at pen shows when available. As mentioned before, we primarily produce reviews to reflect our different hand sized perspectives. We thank you for your continued readership! Katherine: The Pocket 20 is so cute! And this material is gorgeous. Overall, I prefer the look of its longer sibling, the Model 20, but the P20, especially in a nifty material like this is quite nice too. 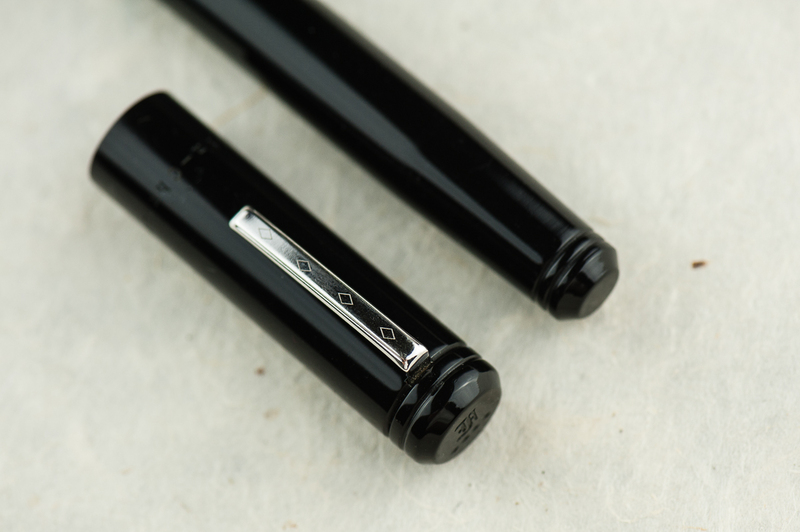 My one gripe, as with the Model 20 is that the engraved lines are a little weird to me — I’d prefer this pen if it didn’t have those and was just a smooth cylinder. But, the busier material on this pen does a good job of hiding them. Pam: The material on this pen is outstanding. It has a lot of color, depth and patterning. I believe that the material is from the now famed Jonathon Brooks. His “blanks” are breathtaking. The shape doesn’t take away from the material and really let you see it in all it’s glory. I really enjoy the Pocket 20 for its unique shape and portability. Franz: That Pocket 20 is small! It definitely is a “pocket” pen. I honestly love F-C’s bevel designs on their cap and barrel and the Pocket 20’s silhouette shows them very well. The carved rings leading to the beveled edges are just so cool. 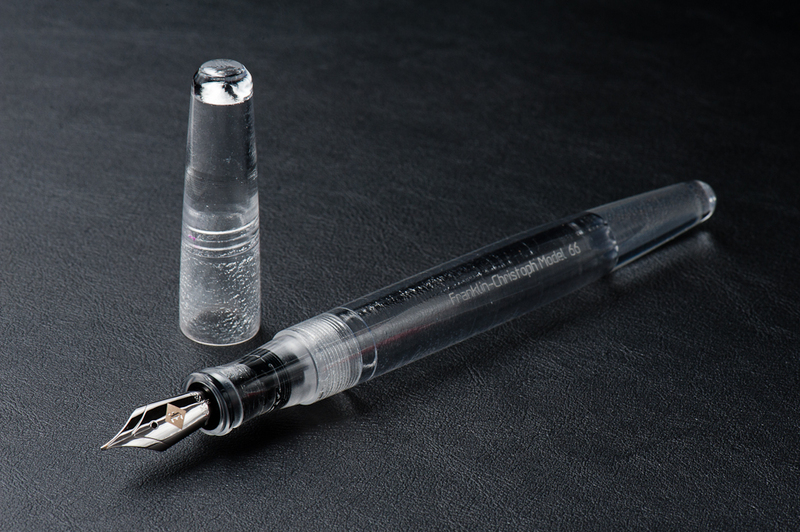 Roz: I have to say, as someone who shies away from the shiny and glittery, the Franklin-Christoph Pocket 20 does a pretty good job balancing a subtle glimmer while still having distinct flecks of shine in its pen. It’s more a galaxy sparkle versus a disco ball. Katherine: I love the F-C Masuyama FCIs. And this one was no different. A wonderful balance between smoothness and line variation — this is the nib that first got me thinking about line variation and how much fun it could be. Everyone should try this nib at least once. Pam: I am really partial to cursive italics for their crisp line variation. 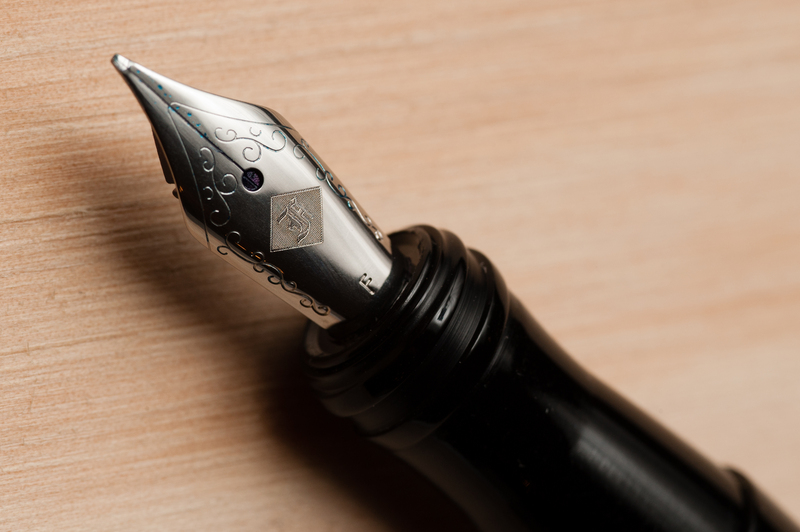 The fine cursive italic is a well tuned nib with the right amount of ink on paper. 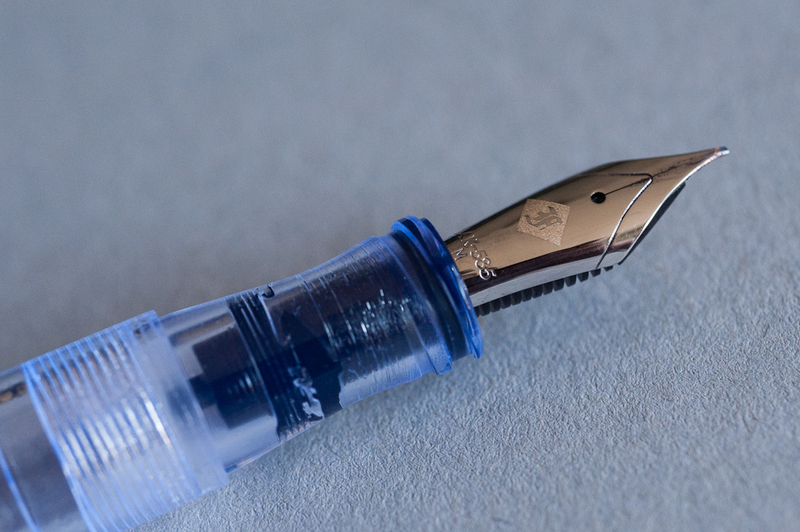 I agree with Katherine that this nib is worth trying for yourself, particularly with a gold nib. I am a firm believer in steel nibs (particularly in my newly dubbed “tiger grip”) however, this is an example in which having a “springier” material is beneficial to the line created and the writing experience. 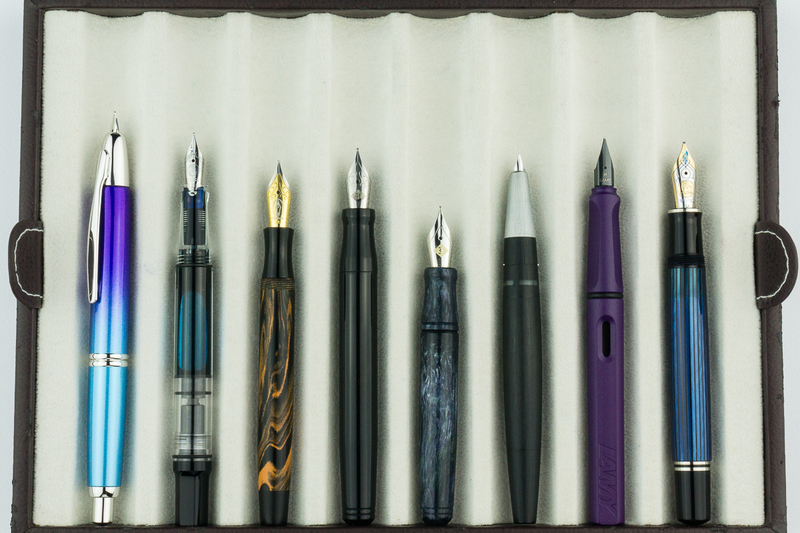 Franz: I must mention that recessed nib/section designs float my boat. 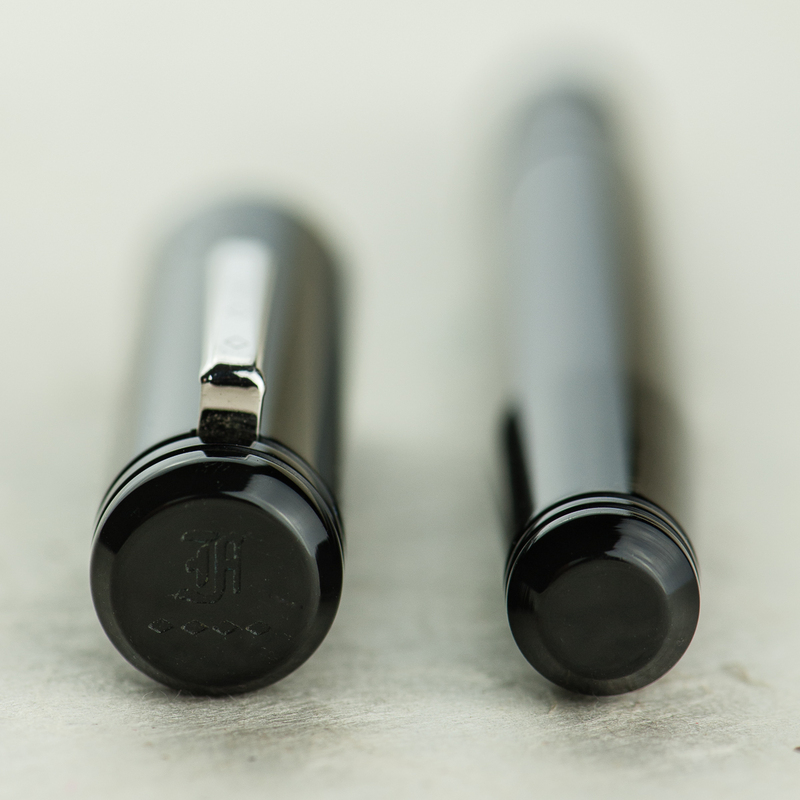 The Pocket 20 and its bigger brother, Model 20 Marietta, have the same design and fits a #6 nib size. This fine cursive italic was tuned perfectly with beautiful line variation. I definitely enjoyed writing with it. Roz: The nib on the Pocket 20 took me a while to get used to. Even though I find it maybe too scratchy for me to write comfortably, the lines are very sharp and crisp. Katherine: I find the Model 20 quite comfortable, and the Pocket 20 is no different. It’s shorter, but because the Model 20 is so light, the Pocket 20 feels very similar. The big upside is I can imagine eyedropper filling a P20, but not a Model 20 (I’d just NEVER write it dry) — and eyedroppering could give it a little more heft, if that’s what you’re looking for. Personally though, I enjoy the way it feels like a light extension of my hand. Pam: I prefer both the look and the feel of the Pocket 20 compared to the original model 20. Due to the slip cap, I find the pen to be really comfortable. Even more comfortable than the pocket 66 due to the lack of a step and threads. 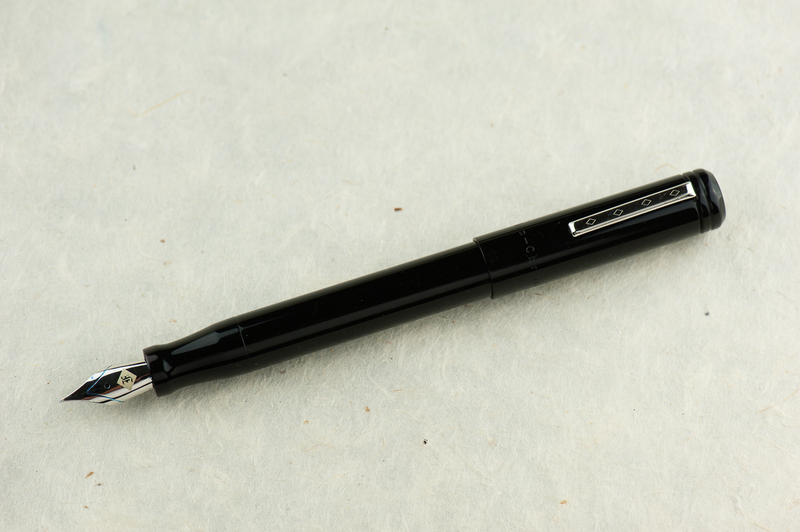 I think the only other F-C pen that I find comparably comfortable is the model 45. So if you like the model 45, the Pocket 20 is a winner. Franz: I wrote with the Pocket 20 posted for about 15 minutes and I love that it posts deeply and provides a balanced weight. It weighs almost next to nothing and I did not feel fatigued at all. There’s pretty much no step between the section and the barrel and I gripped the pen comfortably. Unposted mode for the bear paw? It’s a short pen for comfort and I’ll just take another half a second to post the cap for longer writing sessions. Roz: Super light! The Pocket 20 was so light I almost lost track of how long I would be writing. I did need some adjustment time getting used to the engraved rings near the start of the pen’s grip, but it wasn’t any deal breaker – just something my thumb had to get used to. Katherine: No clip! This pen loves running away… but it does do great tucked into my zip hobonichi case or dropped into a pocket. 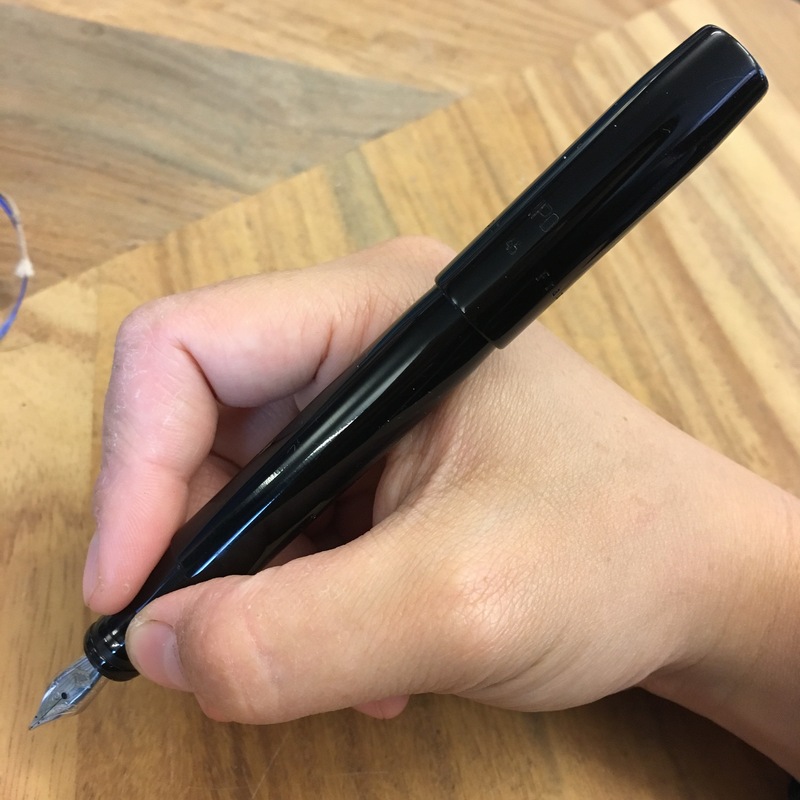 The slip cap is super convenient for notes on the go — but I did notice that there were a few instances where I didn’t cap the pen tightly enough and almost put an inky disaster into my pocket. After a couple scares, I got much better at capping it tightly — but it’s still something I worry about. 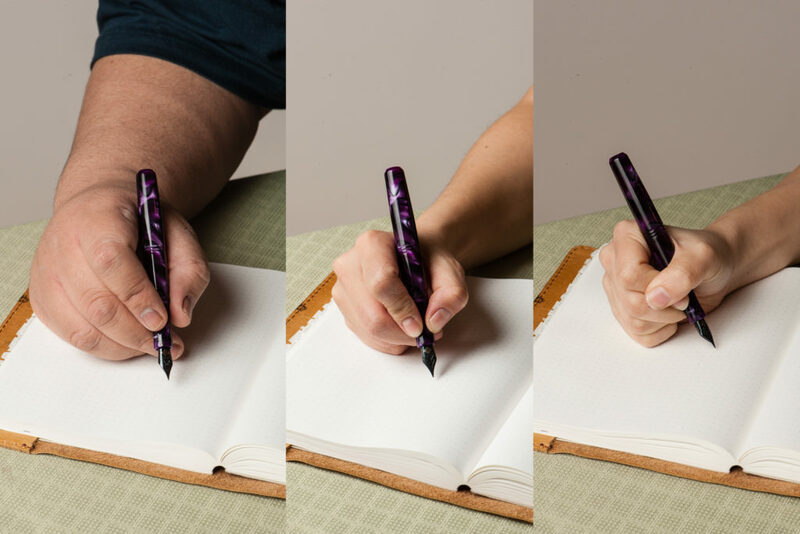 Pam: It’s difficult to justify adding a clip to the pen because the material and lines of the pen already is a complete package visually. However, on a utilitarian point of view, a clip would greatly enhance the EDC-ness of the pen. 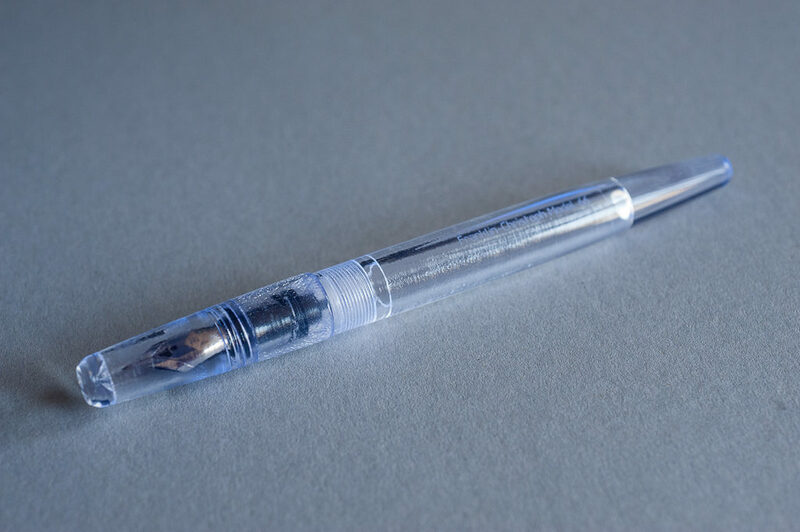 I kept losing the pen to the bottom of my white coat pocket and always feared getting ink all over the section and nib from all the jostling. Definitely kept the pen in a case after half a shift. 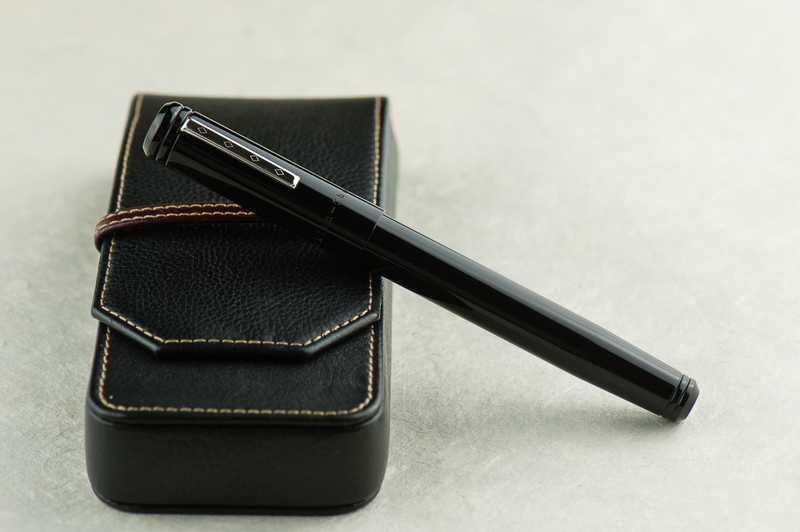 Franz: In my workplace, the Pocket 20 is a decent Every Day Carry pen. No twisting of the cap needed so it was quick to open and sign my name, or take a phone number down. The fine cursive italic wrote nicely on the copier paper we use and gave line variation to differentiate from my co-workers’ gel pen writing. As for carry-ability, just like Pam I found the pen always lying down in the bottom of my pocket and had to fish it out often because of the lack of a clip. Franklin-Christoph does provide the option of purchasing the pen with or without a clip so no biggie. Roz: I’m not confident enough to carry a pen with no clip in anything but my lovely Nock case, but I really enjoyed using this pen throughout the work day. I spend a lot of time stuck on a keyboard, so it’s nice to take a break from typing position and pick up a light pen and go to town! Katherine: If this was my only pen, would I use it and love doing so? Yeah. Do I own one? Nope. Where’s the disconnect? Welllll — It’s a perfectly solid and reasonable pen, but the aesthetic doesn’t stand out to me. It’s a pen that gets the job done and I enjoy writing with (I do own two FC+MM FCIs) but given all the pen choices out there (even just from Franklin-Christoph!) 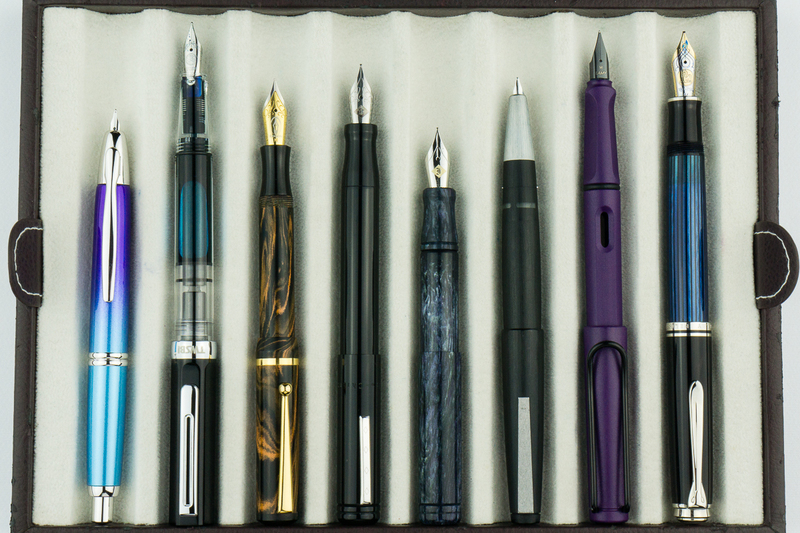 I like other pens more. Pam: I really miss the beautiful utilitarian-ness of the Pocket 20. Honestly, the slip cap and clip (should there be one), makes this pen a great pen for quick and easy deployment. It’s not as great for “rough” play like a Kaweco Sport due to the lack of threads to cap the pen, but it’s the perfect pen for my specific use case at work. If you are in the market for a beautiful pen that is really convenient to use for quick note taking without rough and tumbles throughout the day, this pen is for you. Bonus, there are enough materials this pen is made in to match any person or setting. 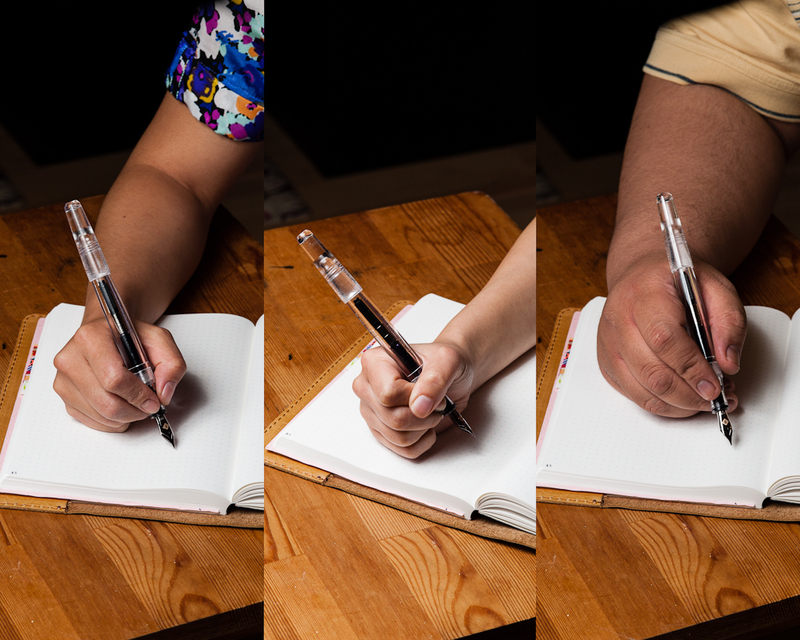 Franz: The Pocket 20 is a neat pen to have and if pocket pens are your jam, you gotta have one of these. 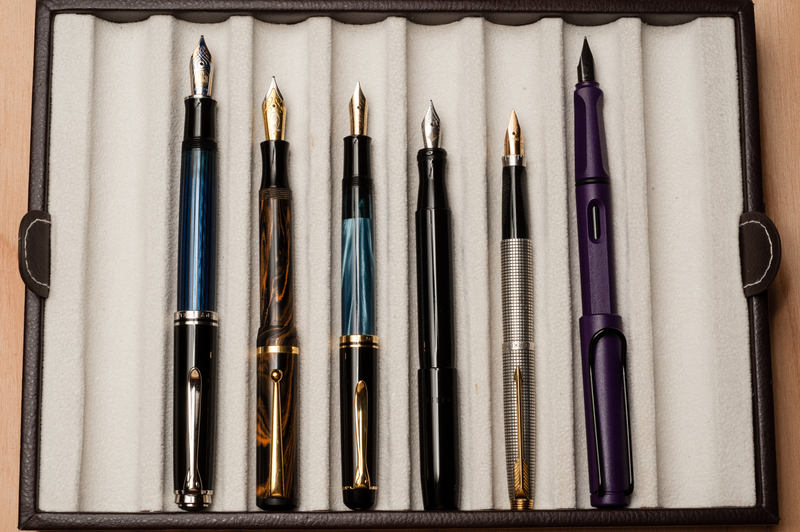 For my pen habit, this wouldn’t be a pen I’d always have in my pocket due to the smaller size however, I would keep it inked up and kept in my daily bag for portability and emergency use. Roz: I admit I started off unsure about the look, the nib, and the grip of the Pocket 20. However, at the end of my time with the Franklin-Christoph, I must say this pen really grew on me. 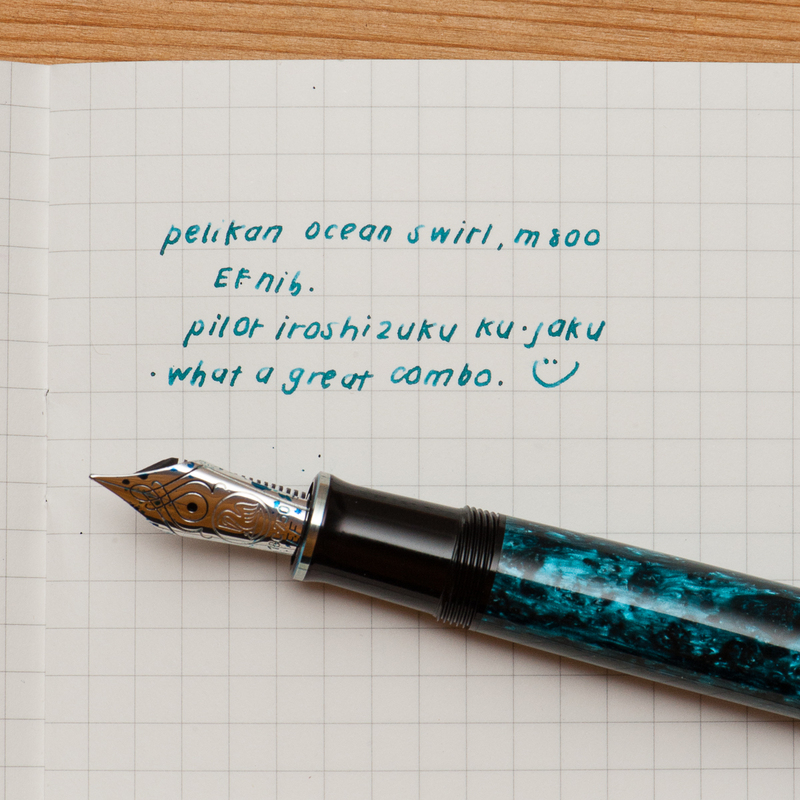 It was a pleasant pen to write with and I enjoyed having a chance to really try the Pocket 20 out! Katherine: The grey frosty cap reminds me of dirty snow, and the dusty purple ink of cold winter nights… just kidding. I just really like this pairing, and the pen is new to me, so I’m really excited and using it a lot. I first saw this pen over a year and a half ago (on May 12th, 2016 — I don’t remember many dates, but I remember important ones! 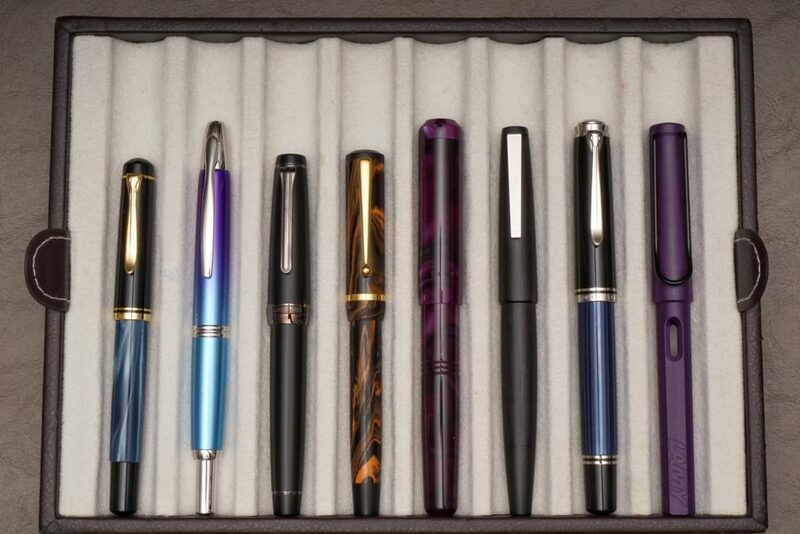 ), in the pen case of a friend (who shall remain nameless), and I fell in love. I tried other pens in the meantime, a black FC 45 IPO (which we reviewed) and a Wonderpens Model 20 in the same “bronze” material… but it wasn’t quite the same. To me the combination of this smokey material and compact form factor (with a sprinkle of nostalgia) is magical. Don’t judge. 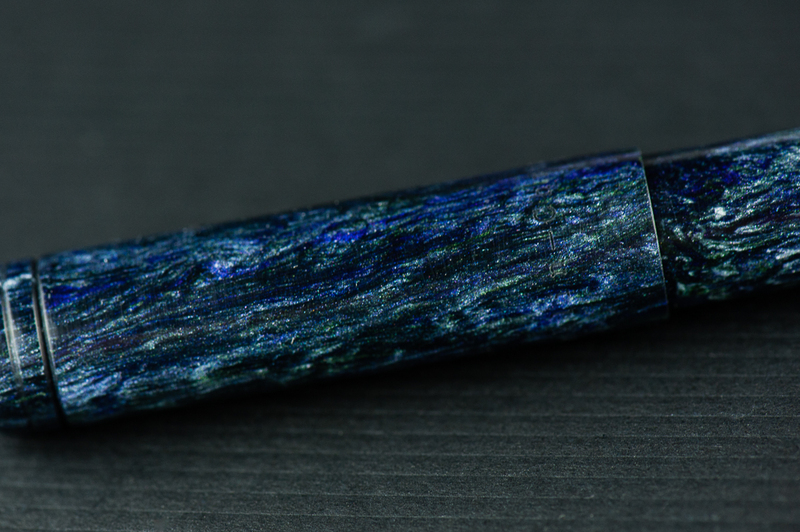 Anyway, friend decided to buy some fancy urushi pen or something, and offered me this pen… and now it’s MINE. Franz: The first month of the new year is represented by a vintage Pelikan! 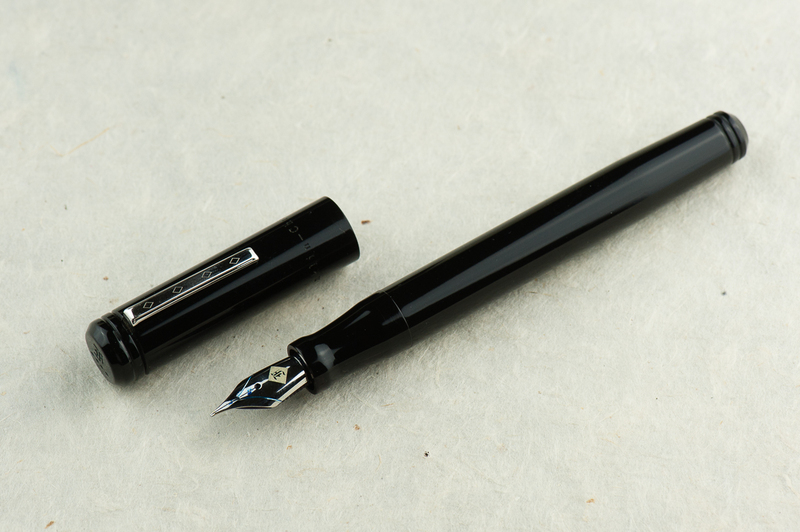 Actually, this is my oldest Pelikan pen and it’s a Pelikan 400 in black-striped finish. This was actually one of the last pens I received in 2017 so it’s more of a recent acquisition. 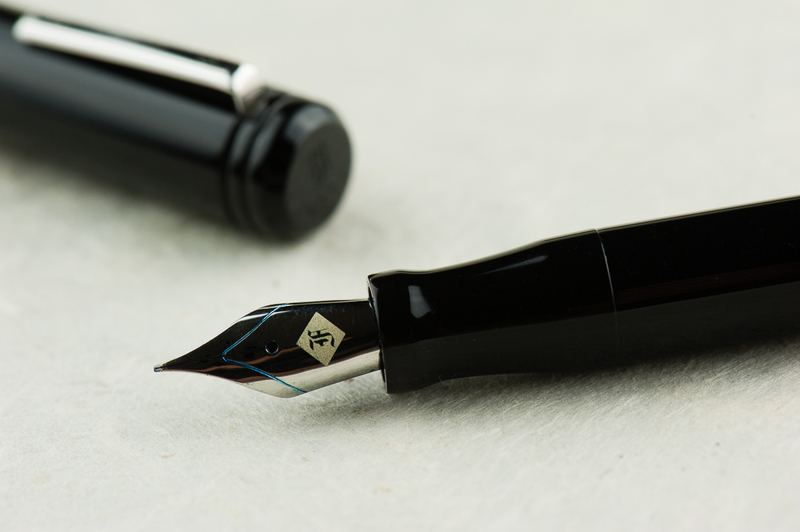 Upon my review, this 400 was manufactured around the year 1953 due to the lack of engraving on the cap band and the nib imprint without the Pelikan logo. The black stripes are between green translucent strips that let you see your ink level very subtly and I find it very captivating. It took me almost a year to find this pen at a reasonable price and be in decent condition. 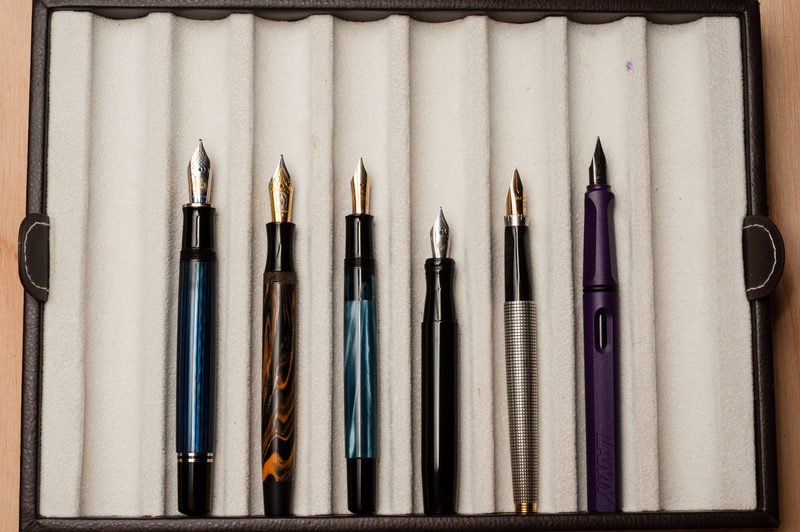 And having an oblique medium nib allows me to use it at work and for my journaling as well. 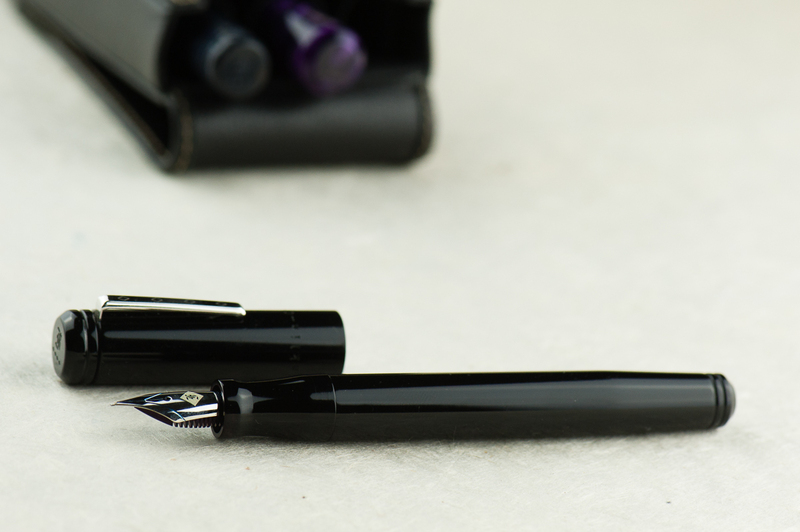 When I received the pen in December 2017, it took me three days to decide what to ink it up with… three days! I’m sure you fountain pen folk will understand. 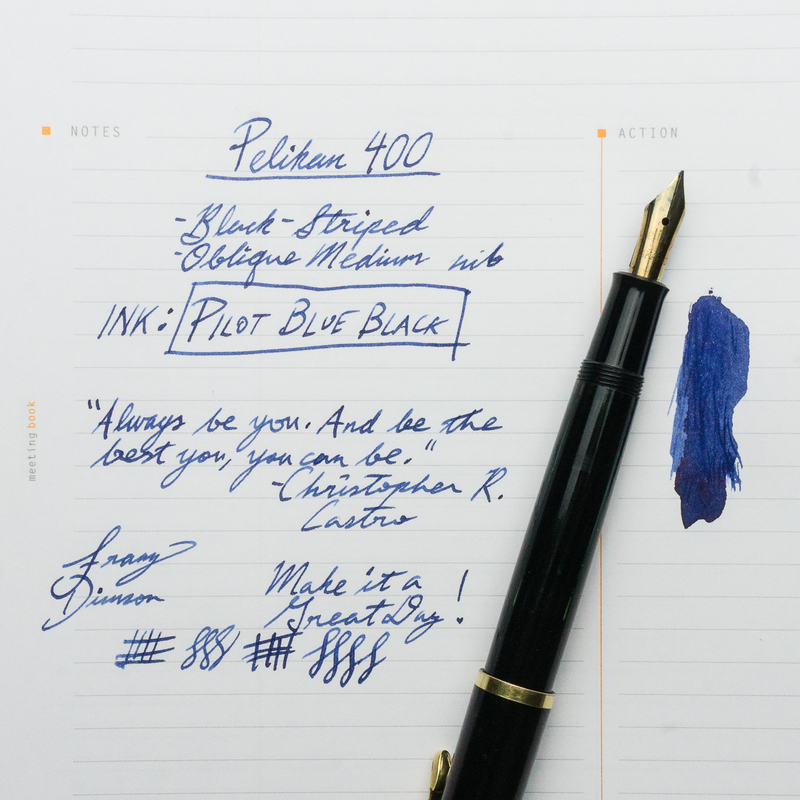 Anyway, I decided to ink it up with Pilot Blue Black which is very familiar to me and usable at work. Since Pilot Blue Black is water resistant, if not waterproof, it’s what I use at my workplace for documents to alternate with Noodler’s Liberty’s Elysium. 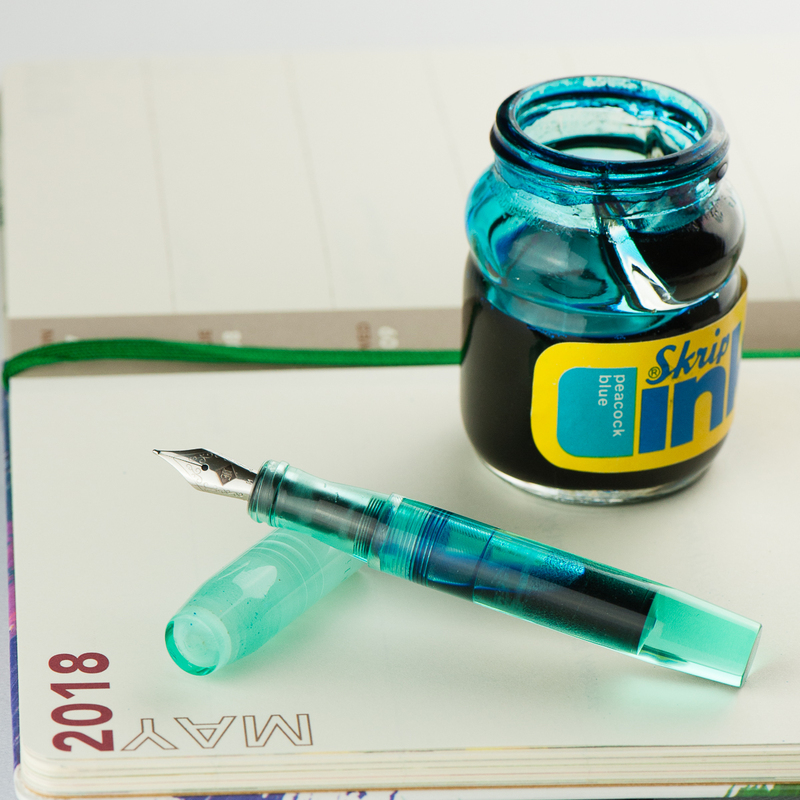 What favorite pen and ink combo have you been writing with for the month of January? Katherine: I really like the material of this pen. It’s so pretty! The design of the pen isn’t my favorite though, but in the grand scheme of things, it’s not bad. It’s probably worth noting that I’m not a big fan of what I think of as FC’s “chunkier” designs, or the indented rings they like putting on pens. I love their models with clean lines — the 45, the p66, 66 and (a little bit less) the 20, but the 31 just isn’t as clean. But, personal preference. Pam: I was blown away by the size and material of this pen. 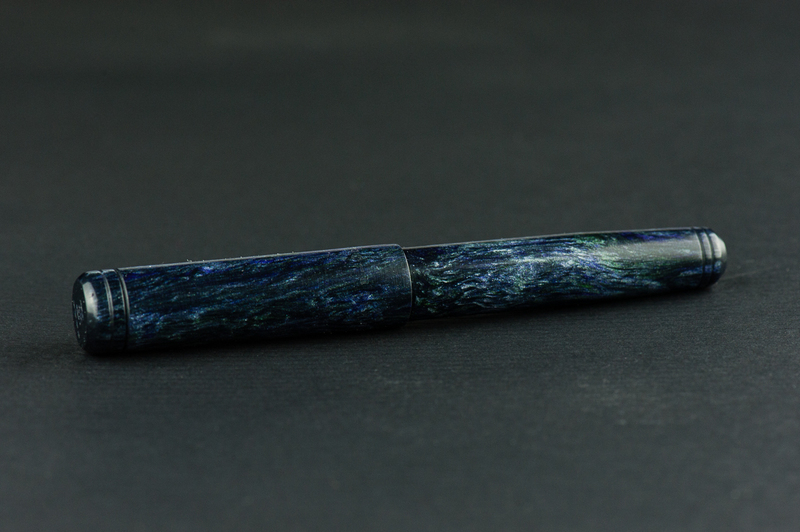 The material of the pen is stunning with alot of iridescence and depth. I really like the shape of the pen, but the size of the pen is a bit much for me. I have mixed feelings about the indentations on the body and the placement of the nib. It adds texture to the body and interest in the eye, but also breaks up the lines of the pen shape. The nib is semi-hooded which baffles me a little bit. 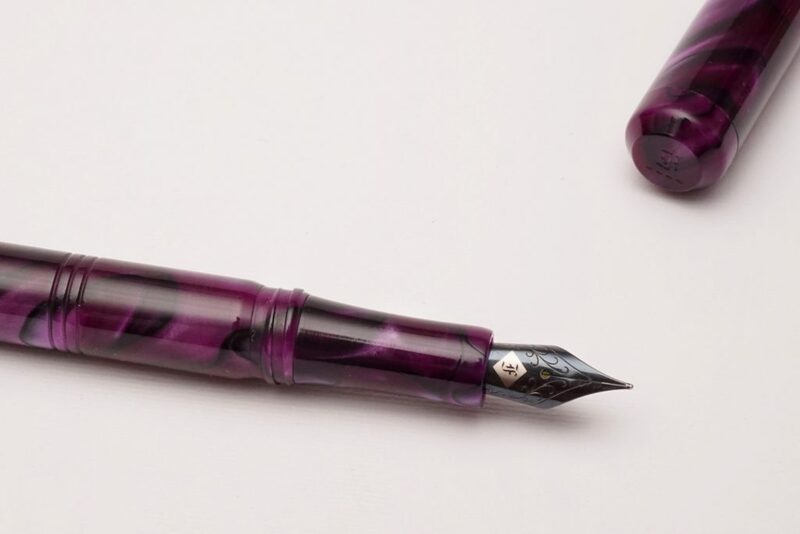 I didn’t notice this before on other FC pens and I can’t decide if I like it or not. 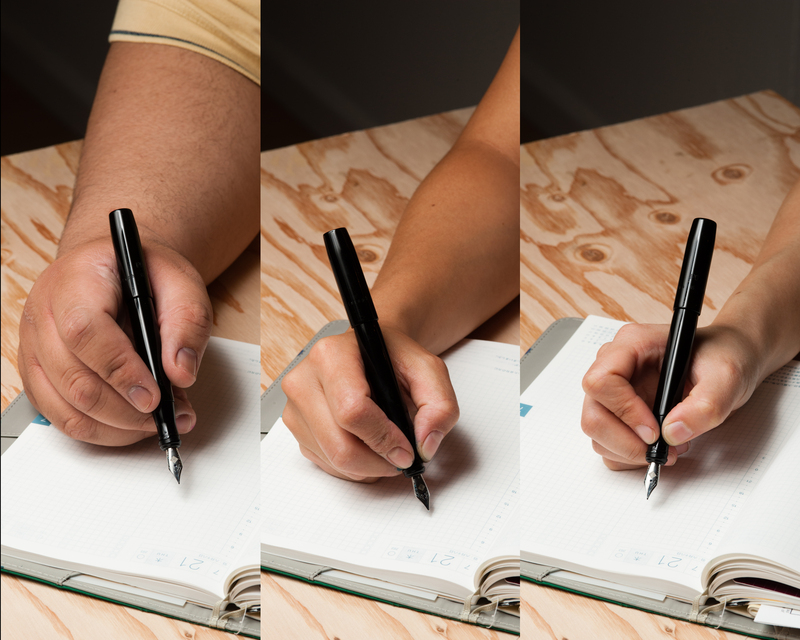 Overall, I think the model 31 is a great add to the line up for those with larger hands or prefer larger pens. 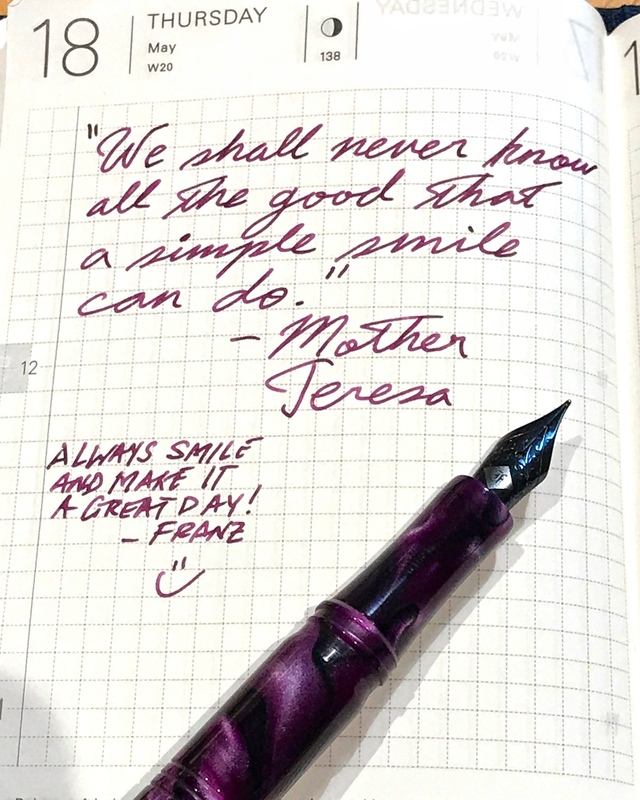 Franz: “Holy swirly purple pen Batman!” Yep, that was my reaction when I saw this at the LA pen show in February 2017. This was the first Model 31 I ever saw and it was (at that time) the only prototype in the purpurae material. When I saw this pen, I knew I had to have it. 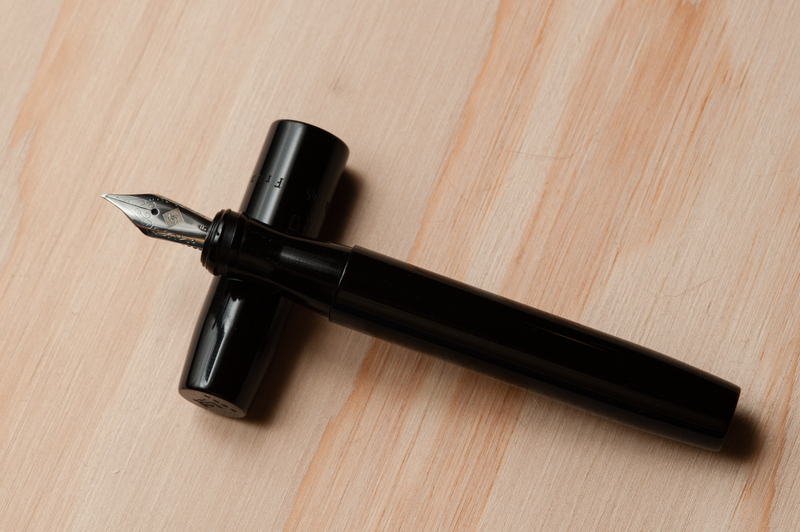 Anyway, going back to the pen model, this is a fairly large pen size in the Franklin-Christoph line up. Their model 19 is still the largest of the group but I think the model 31 is just a level below that. Now for the details that my co-bloggers have mentioned, I love the indented rings on the barrel as it’s quite distinctive. 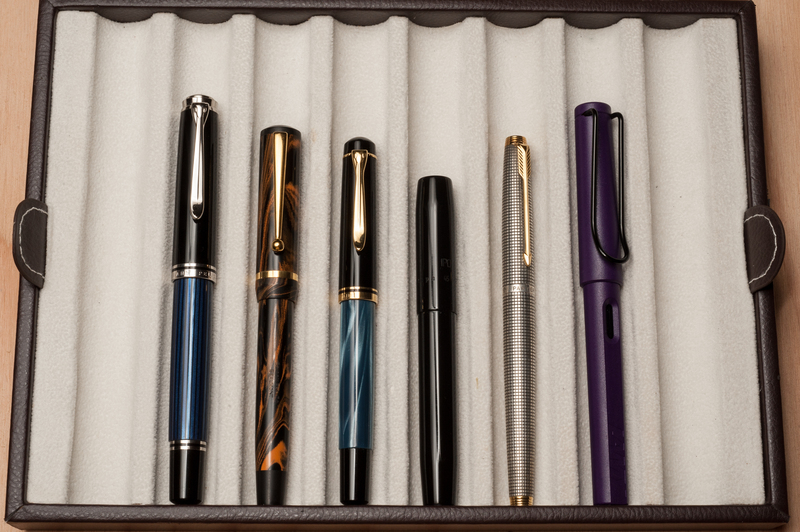 While I’m at a pen show hovering at a Franklin-Christoph table, I can immediately identify a model 31 from their display because of these rings. The nib is recessed just like their model 20 and provides a smooth transition from the section to the nib which I’m liking very much. 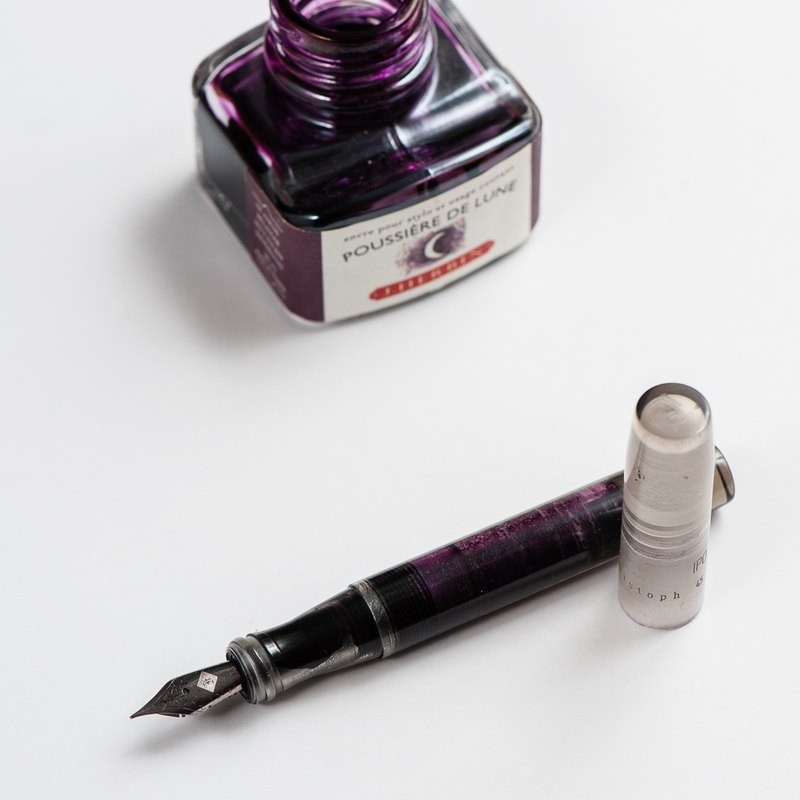 Katherine: Like all FC nibs, this one was a comfortable and unproblematic writer. Franz had a steel medium in it and it was smooth, wet without being soggy, and an all around undramatic but very reliable writer. No complaints! Pam: Like all FC nibs that I have tried, it wrote well. Smooth, saturated lines without getting too heavy. The black anodized nib is amazing. 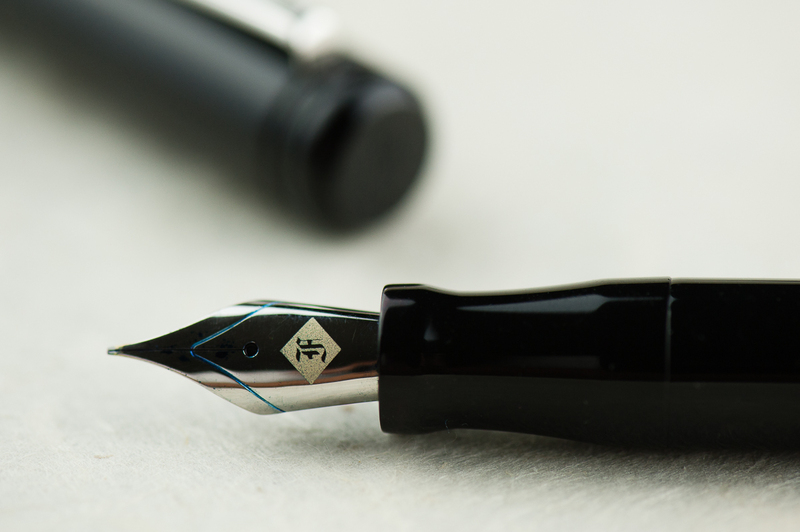 I particularly like how the logo stands out on such a sleek nib. 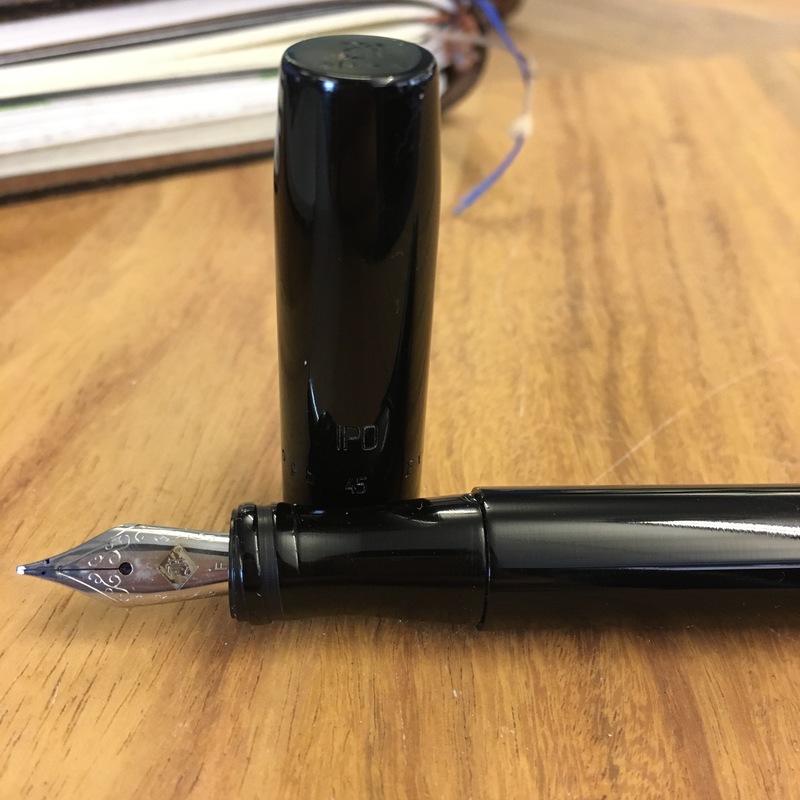 Franz: Surprisingly, I asked for a stock medium nib when I got this pen and Mr. Jim Rouse actually chose the Shadow (black) finish of the nib to match the pen. 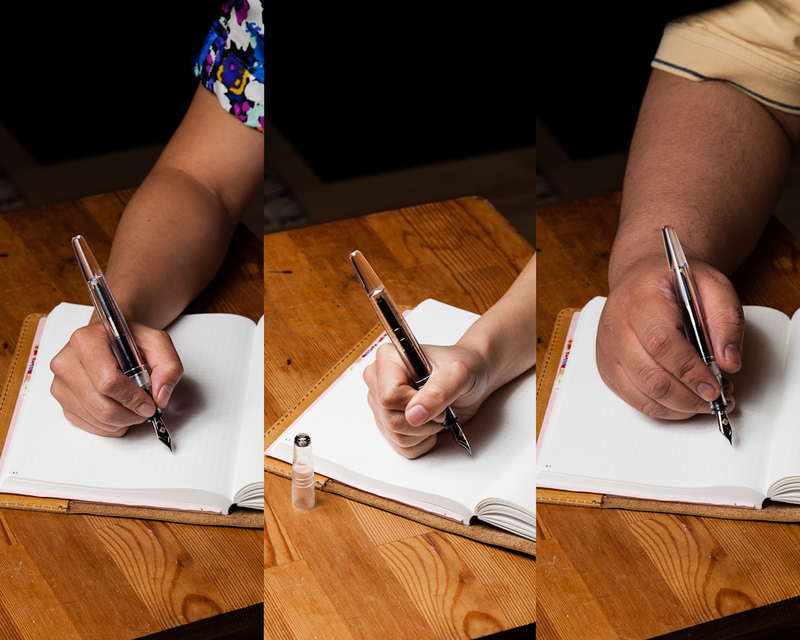 As with all Franklin-Christoph pens bought at a pen show, the nib is tuned by Jim to your writing preferences. So this medium nib is one of the smoothest, and perfect flow writers I have. Katherine: This pen was a wee bit top heavy when posted (the cap doesn’t post super deeply, so the pen ends up kinda long), but when unposted, is very comfortable. The threads are on the section, so I don’t even have to worry about gripping them when I hold my pen further forward. I could write for pages with this pen. Pam: I preferred writing with this pen unposted. In my pixie handed fist grip I found it to be top heavy when posted. I had no issues writing with this pen as I found it relatively light (for it’s size) and well balanced. 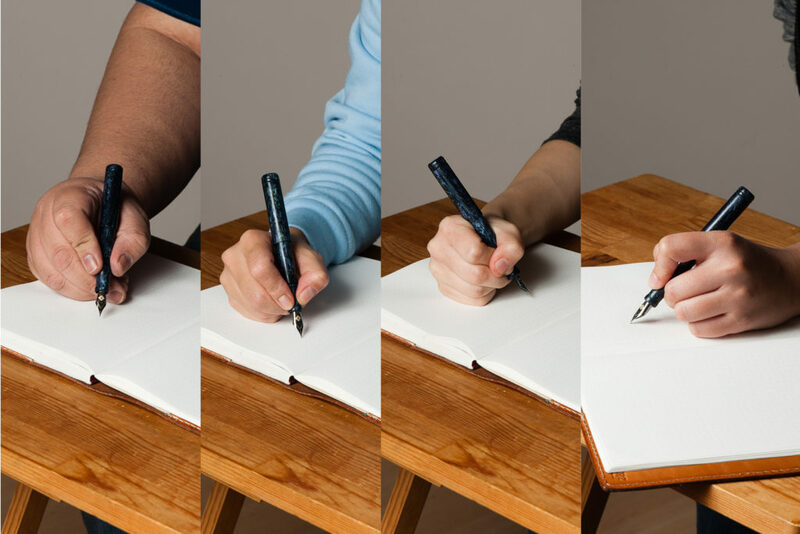 The width of the pen is quite comfortable for either the fisty grip or the tripod grip. 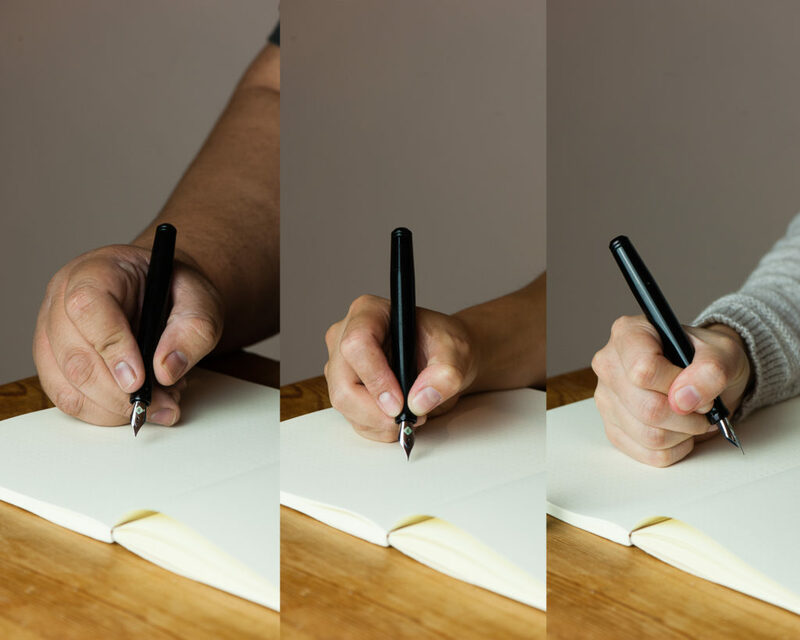 For a larger pen, it is quite comfortable in petite hands. I wrote with the 31 unposted, and posted equally within twenty minutes and it was a very pleasant journaling session. Katherine: This made a solid EDC carry. It feels solidly made, uncaps fairly quickly and has a reliable clip. I wouldn’t hesitate to keep this pen in my pocket, or even throw it in my jacket pocket with my keys (don’t worry Franz, I didn’t!). Pam: Like all FC pens,I have no qualms using this pen as an EDC. It’s well built and should there be a clip, a great add on to any shirt pocket! Franz: I have used the Model 31 at my workplace quite a few times already and it works nicely as an Every Day Carry type of pen. The medium nib writes nicely on the cheap copier paper and the cap twists off very quickly for fast writing requirements. The only issue of this specific pen is that it’s clip-less and at times I worried that It might roll away when I set it down. Thankfully it hasn’t happened yet. Let me just add that when I bought this pen, Jim said that I can request to have a clip installed if I wanted to. 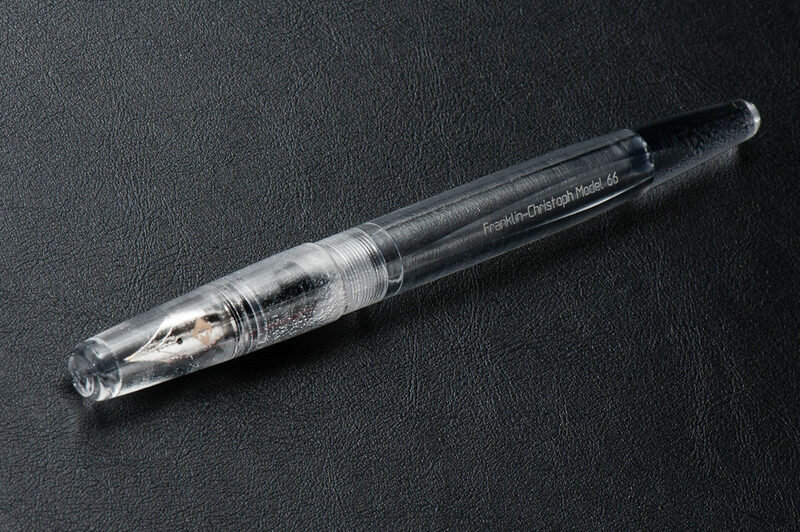 So far I like it as it is but if I change my mind, I’m sure Franklin-Christoph will take care of it because their great customer service is legendary. 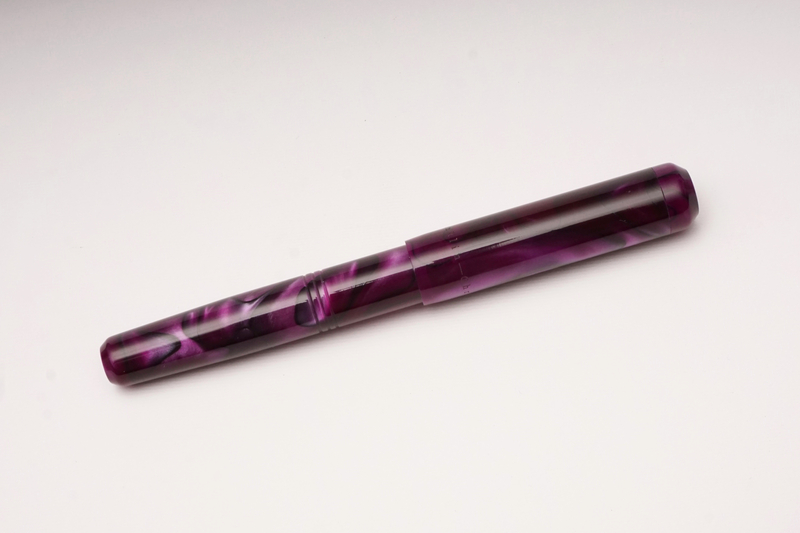 A couple months ago, I featured this pen paired with Pelikan Edelstein Amethyst ink. It just matches! Katherine: All in all, I think (like most of FC’s pens) this is a very solid, well made pen. However, the aesthetics just don’t jive with me. I love the material, but ultimately found the pen a little too chunky and a little too busy for my tastes. But, if the look appeals to you (and now that I’m looking at their website… perhaps that yellow and black?) it’d be an easy buy for me. 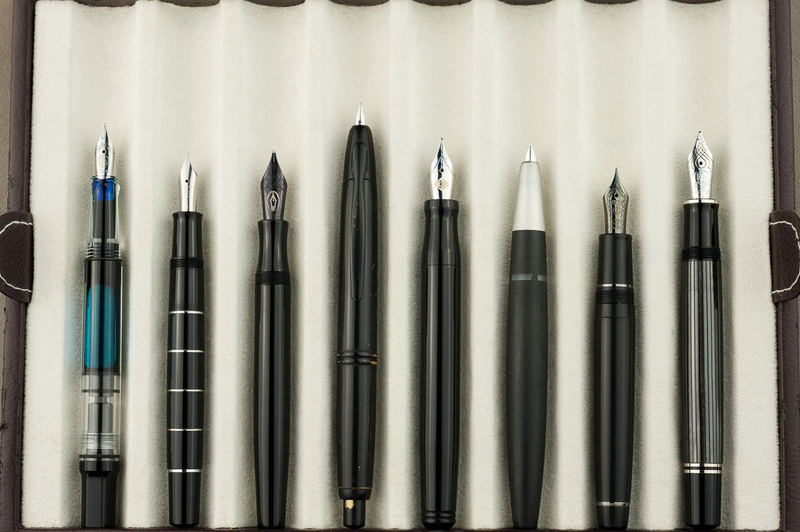 Pam: Franklin-Christoph has a pen to suit every taste, hand size and aesthetic. The model 31 is a bit big for me and the material is not exactly my cup of tea. 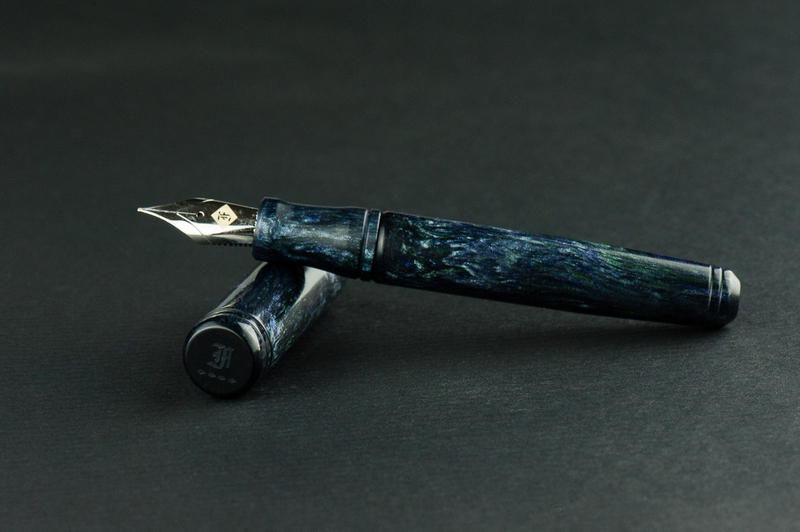 Although this pen doesn’t particularly scream “buy me,” I have been a fan of FC for a while. The pocket 20, model 45 and model p66 are totally up my alley. FC materials are also always amazing, so you really can’t lose! The model 31 is a great add for any collection really. 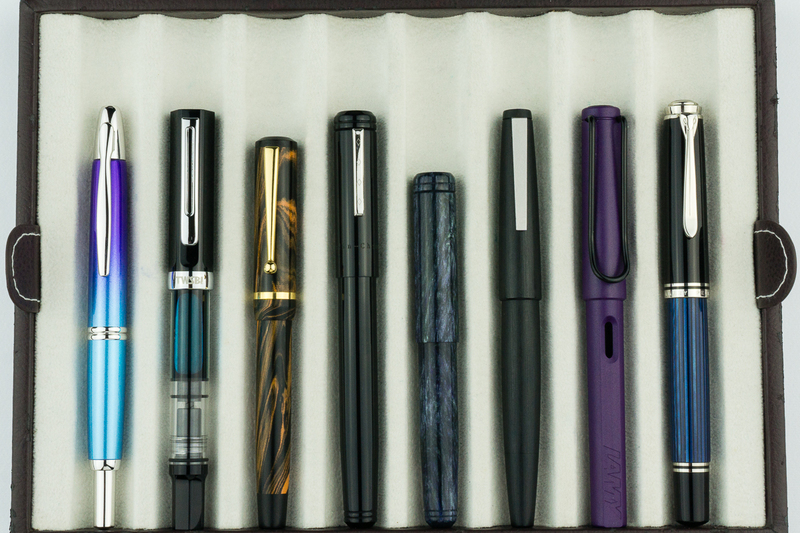 You should really check out their table at your nearest pen show. Franz: Dude… it only took me a couple years but I think I can finally say that I found a Franklin-Christoph pen that fits my hand very nicely. As contrasted by the experiences of the two ladies above, I would recommend the Model 31 for people with medium to larger hands. If you think the model 03 is kinda small, and the model 19 is too big, try out a model 31. You never know. 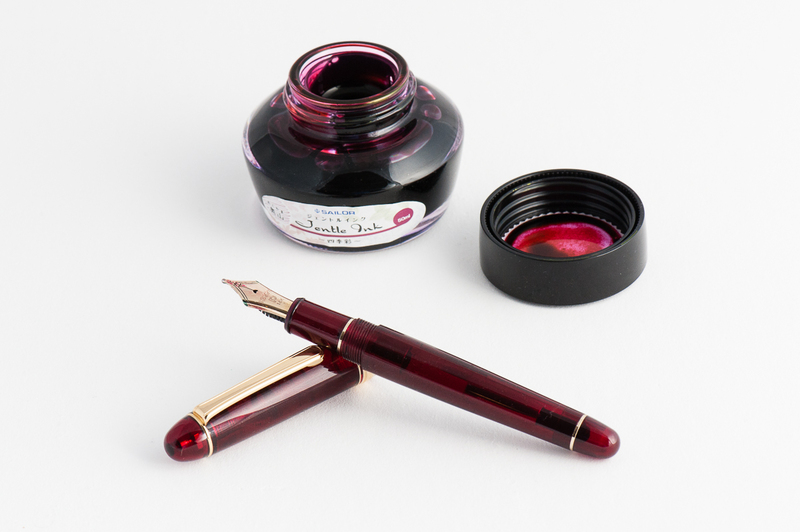 Katherine: This month my pairing is a Platinum 3776 in the red “Bourgogne” color, with Sailor Okuyama. 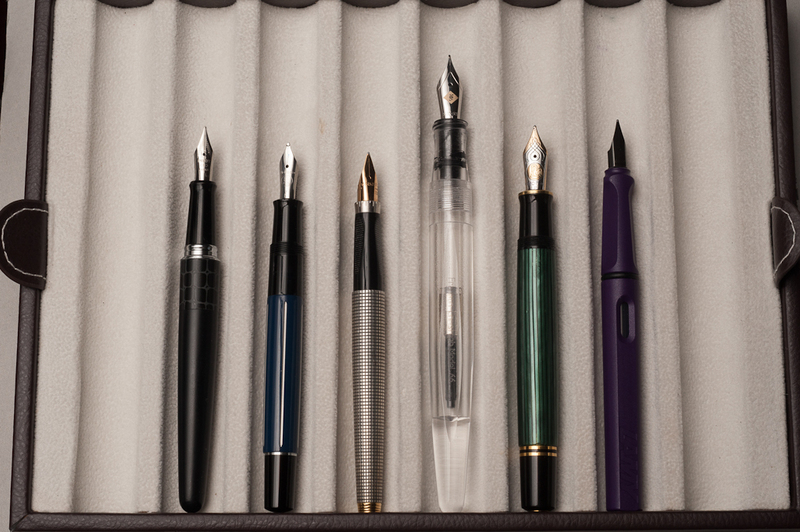 I picked up the 3776 (I previously rated it one of my top pens) because of the C nib. C stands for “coarse” and is Platinum’s BB nib. It’s quite broad, but, out of the box, not a gusher — which I like. Additionally it writes smoothly when upside down, so I can use it at work too! 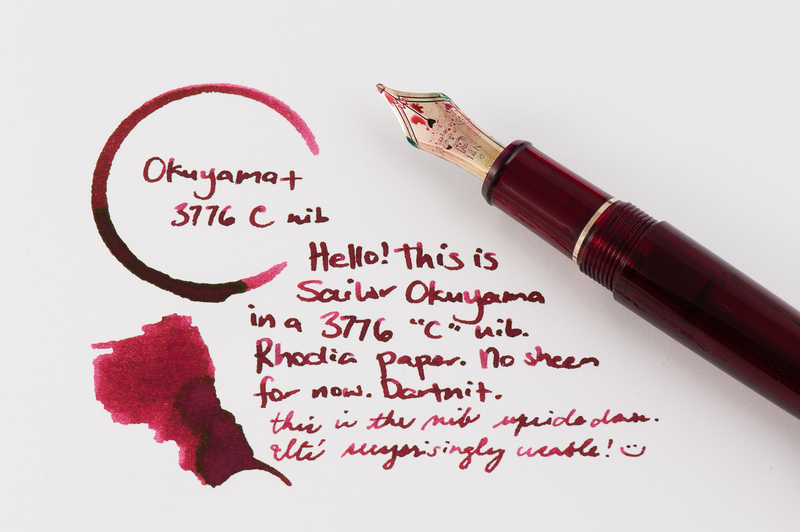 Overall I’m really enjoying the sheen of Okuyama, laid down by a nib that gets the sheen going, but isn’t gratuitous. Franz: A co-worker of mine once said that Purple is the color of royalty, and madness. I totally agree! So for the month of June, my royal pen and ink pairing is the Franklin-Christoph Model 31 Omnis in Purpurae finish, and the Pelikan Edelstein Amethyst special edition ink. 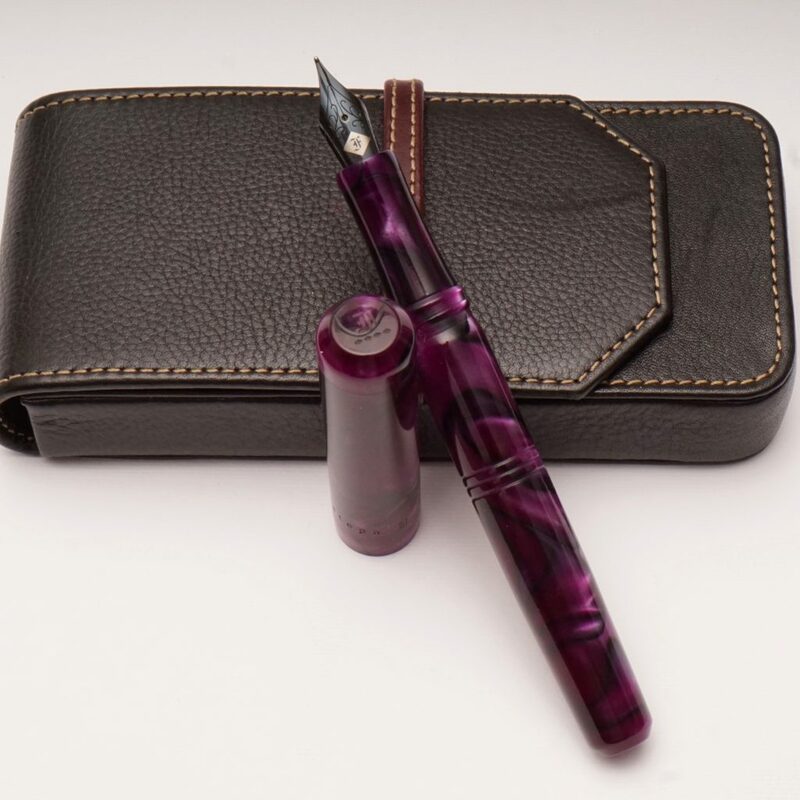 The deep purple and black swirls of the “Purpurae” madly matches the dark purple of the Amethyst ink. The acrylic has chatoyance that just can’t be captured on camera that well especially on the lighter swirls of the pen. 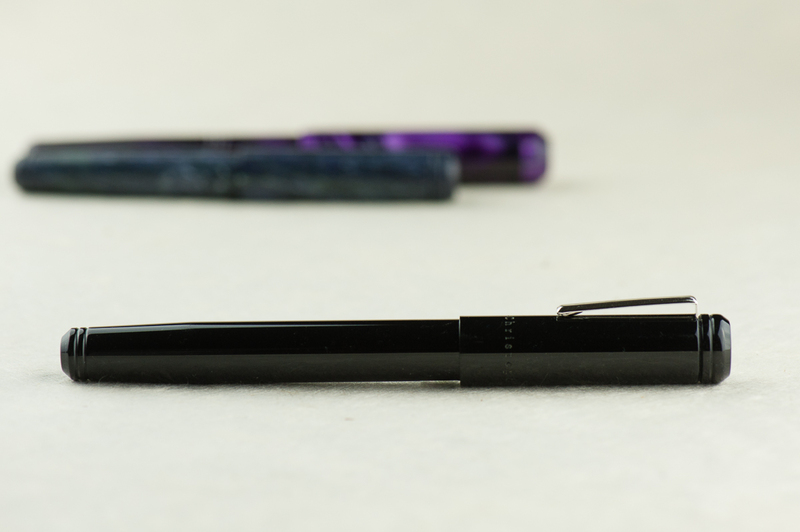 A quick aside, I got the Model 31 at the 2017 LA Pen Show and it was (at that time) the initial color prototype. 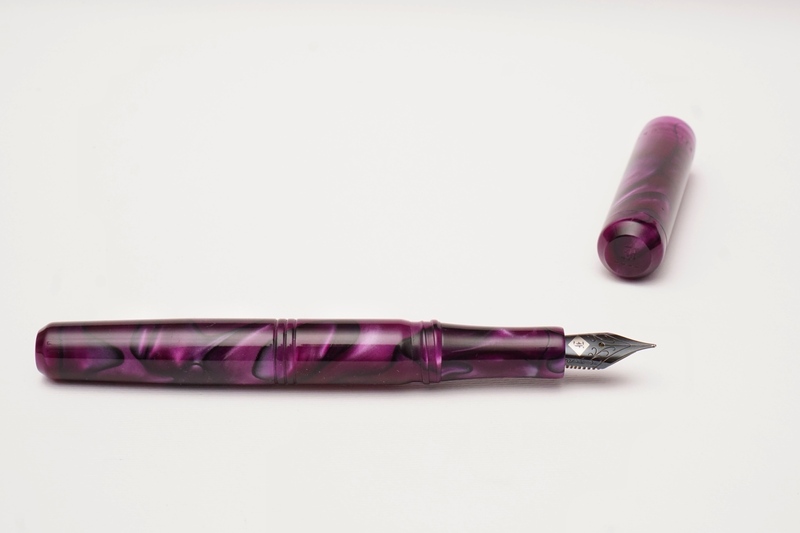 Scott Franklin of Franklin-Christoph commented that this was the first purple 31 out there. 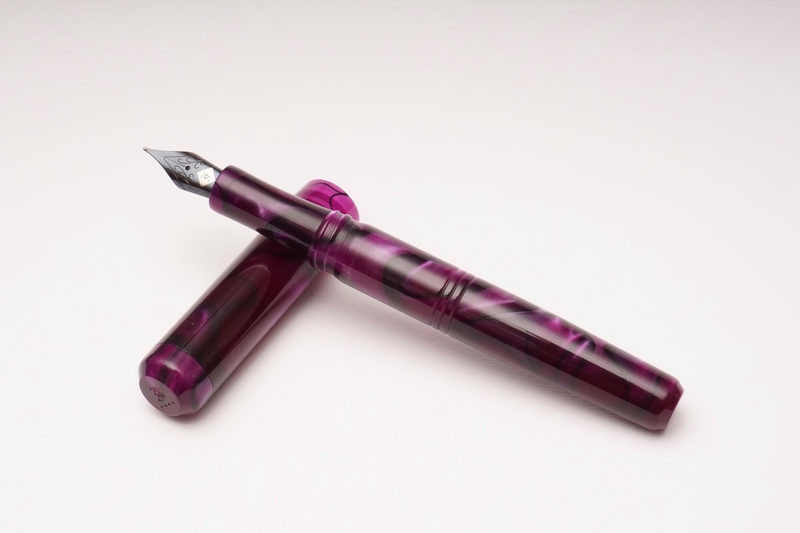 I initially called the color “Purple Soul” but Franklin-Christoph recently introduced it as a regular part of their Model 31 line up as “Purpurae”. 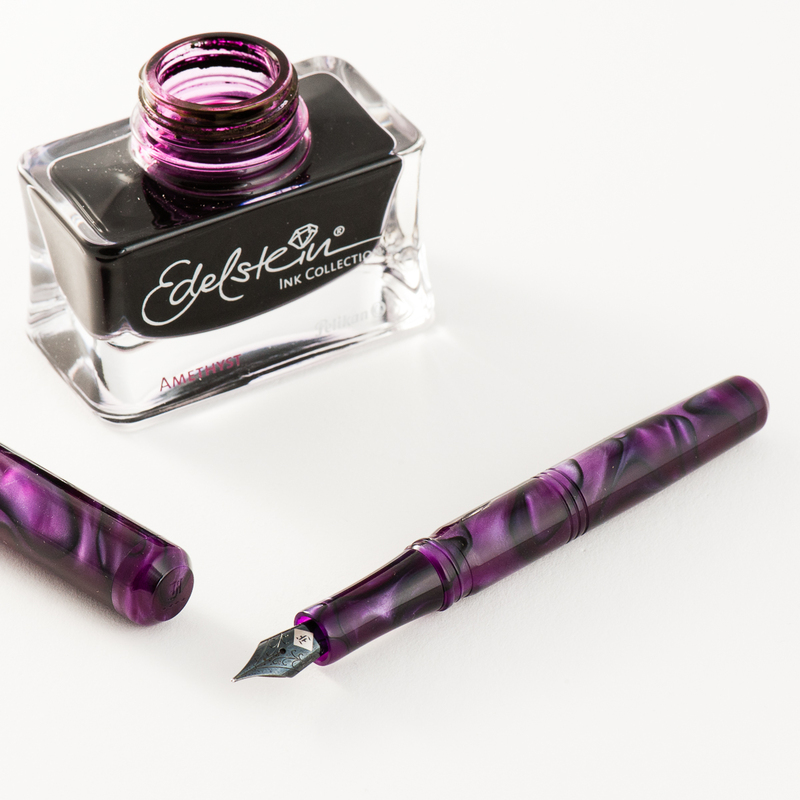 The Amethyst ink was Pelikan’s 2015 special edition Ink of the Year and has become my top favorite purple ink due to it being a darker color, and its sheen when ink pools in the writing. Will this pen and ink pairing become an OTP (One True Pairing) for me? We shall see! Pam: Summer is in full swing but I still miss the rainy season so this pen is a reflection of having the best of both worlds. 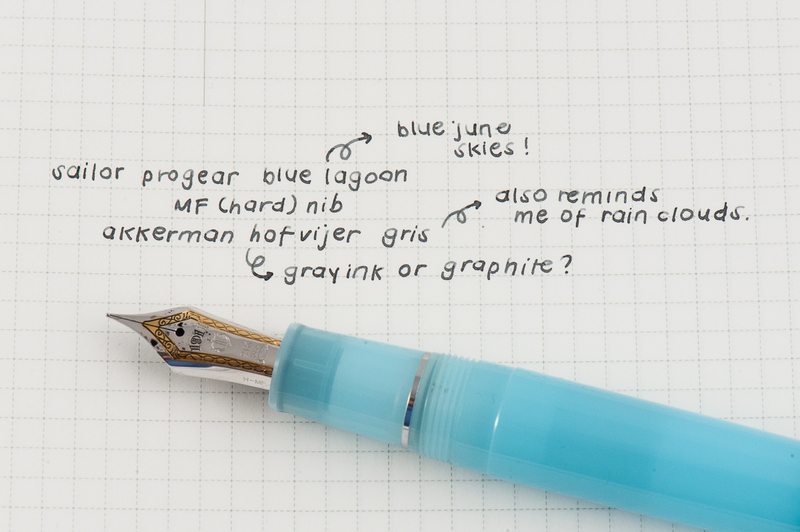 My choice for the June pairing is Sailor Pro Gear Blue Lagoon with Akkerman Hofvijver Gris (#29) ink. This is probably one of my favorite OTP/pen and ink pairings since I started collecting pen. 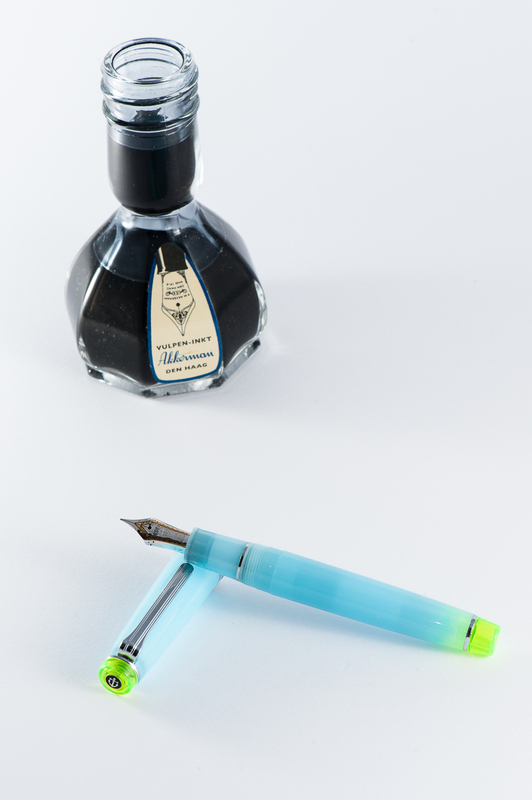 The Sailor progear has a really unique and whimsical color pairing with the neon green and soft blue. The gentle blue with such a vibrant hue reminds me of the “Unicorn Barf” colorway with the blue and bright pink. I have been trying to get the term “Unicorn Snot” for this blue and green combination to stick…but alas. The Sailor nib is perfectly wet enough to show off the wonderful gray ink, as usual. Akkerman #29 is my first ink from Akkerman and I couldn’t be happier with this ink. It’s practically my “gateway” gray, getting me more interested and more inclined to try out more gray inks. I had thought that gray inks would be only dilute and dull blacks. I am so glad to be have been mistaken! Originally obtained via ink sample from Vanness Pens, I quickly tried to obtain a full bottle of this wonderful gray. The gray reminds me alot of pencil graphite and I really enjoy the shading available in this ink. Not to mention, the bottle of Akkerman ink is always a treat in itself! Katherine: This pen looks SO cool. Franz has the Italian Ice version (a special edition-ish material F-C makes some pens in) with a 14k gold Medium Masuyama CI. 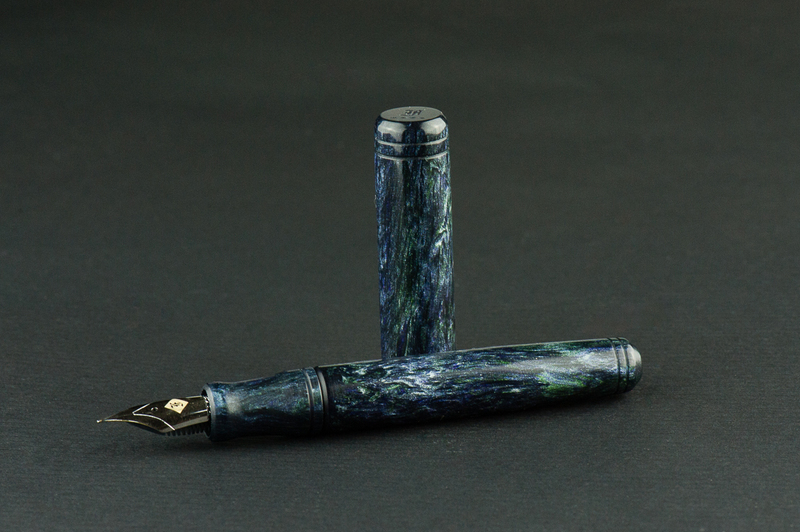 To me there are two elements to this pen — the Italian ice material and the shape. Realistically, both are pretty darned cool looking to me. I love the rounded shape of the 66 and the flat side means I don’t have to worry about it rolling away. I also love the Italian Ice material, the purple hues are subtle but give the material complexity. I think this is an unpopular opinion — but I like the Italian Ice more then I like the Antique Glass. Yep, I said it. 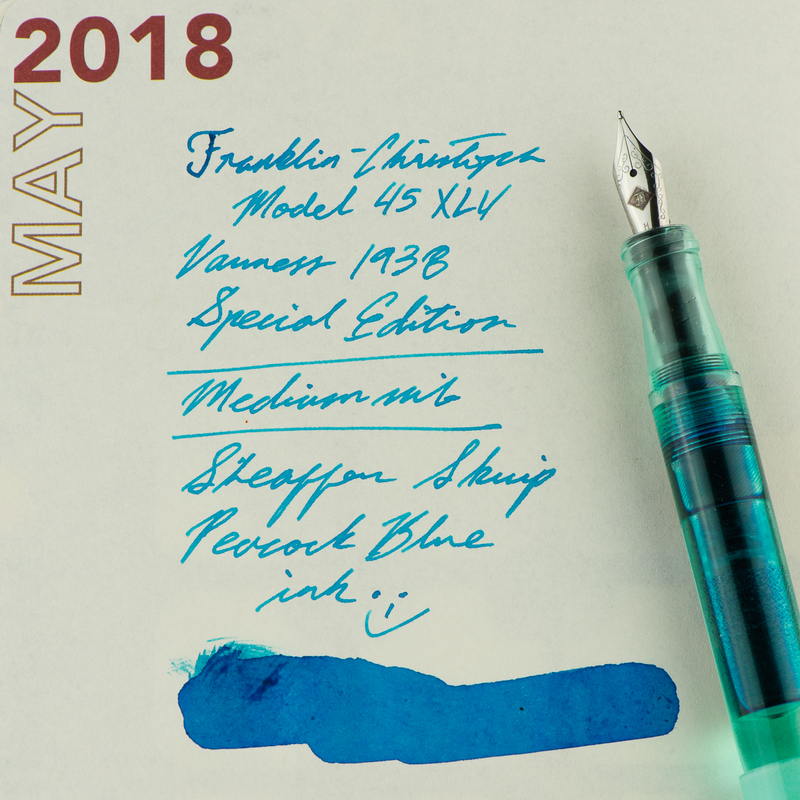 Pam: Franklin-Christoph knows how to tease! This material is pretty unique as its mysteries are revealed with some sunlight. 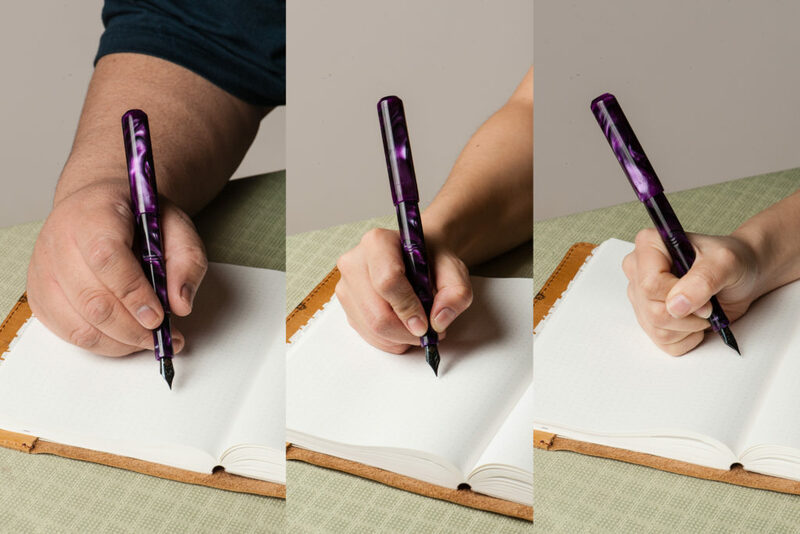 The clear to purple tint is like a wonderful little insider secret to those fortunate enough to have seen the pen in the sun. The Original Ice, Italian Ice or Antique glass material greatly compliments the shape and aesthetics of the model 66. The Original and Italian Ice reminds me of a frosty glass and icicles for the upcoming winter season, respectively. The Antique Glass reminds me of the glass apothecary/pharmacy bottles of yore, filled with ingredients and medicines. 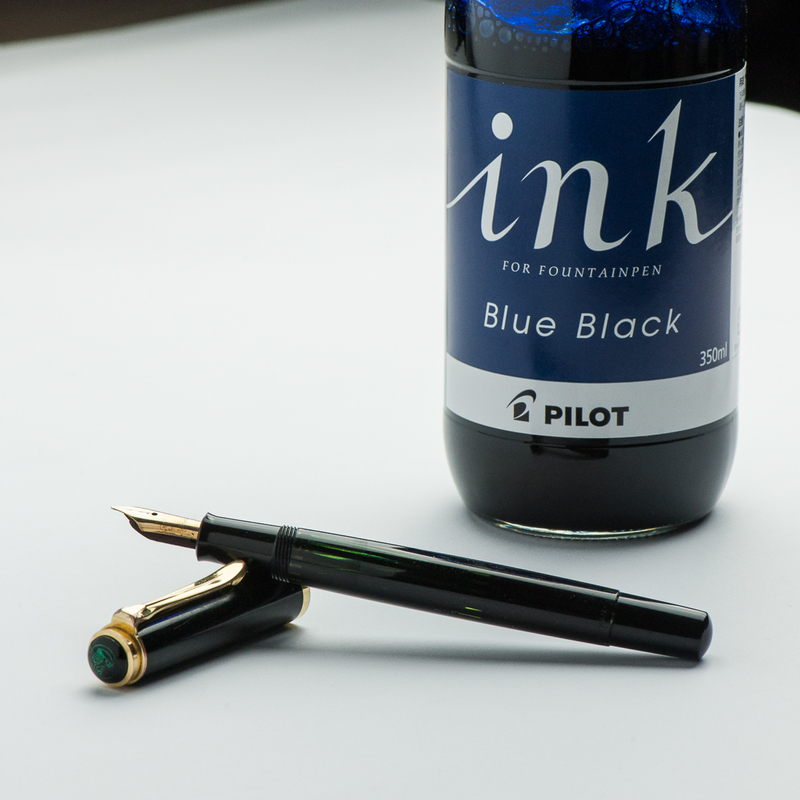 All three materials would really show off the beauty of sloshing ink if filled as an eye dropper. The Model 66 is almost seamless when capped and post-able when it’s not, aka, practically perfect! The flat surface lends unique design and provides the added bonus of an un-rolling feature. I really appreciate the subtlety that F-C employs in branding their pens. The etching is light and unobtrusive to the eye or touch, but in the right angle, easily found. 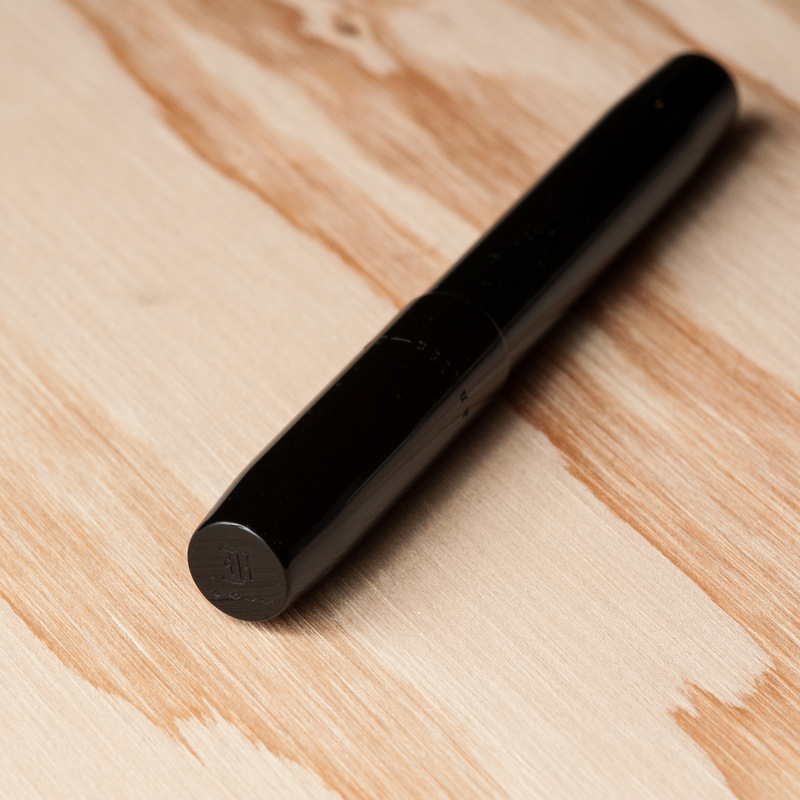 Honestly, with materials and design like this pen, F-C doesn’t need much overt advertisement. Franz: The Franklin-Christoph Model 66 Stabilis has been a pen that I’ve always been intrigued with ever since I held them at pen shows. 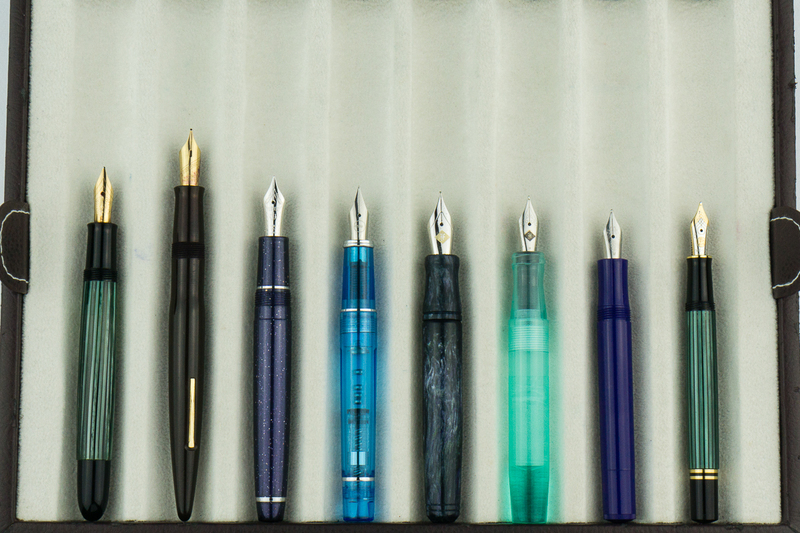 They use the Model 66 to allow their customers to test their available multiple nib choices. I got this Italian Ice Model 66 at the 2016 LA Pen Show and it fills my large hands very well. 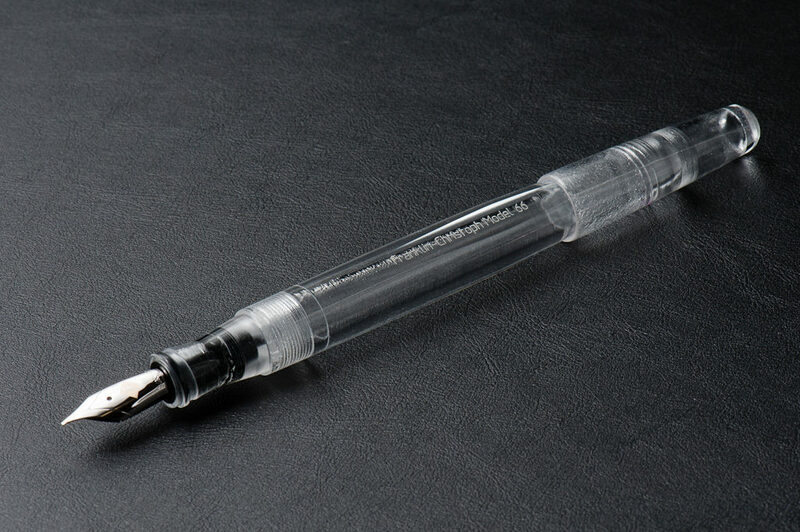 Under even indoor lighting, the pen really just looks like a clear material (as pictured above). 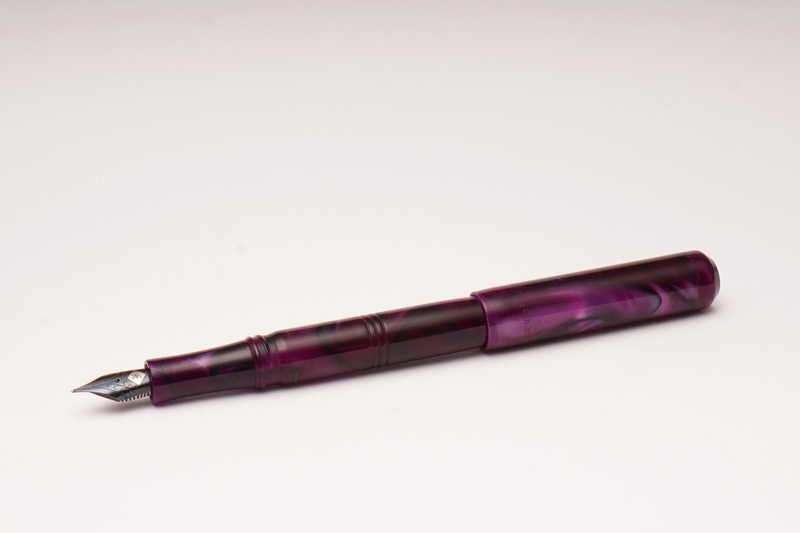 But if the pen is under diffused semi-directional daylight, it has a very interesting purple tint to it. It is quite difficult to photograph the correct color of the tint and unfortunately my photos below are more blueish than what you see in person. The F-C Model 66 may be inked up using a standard international ink cartridge, or converter. 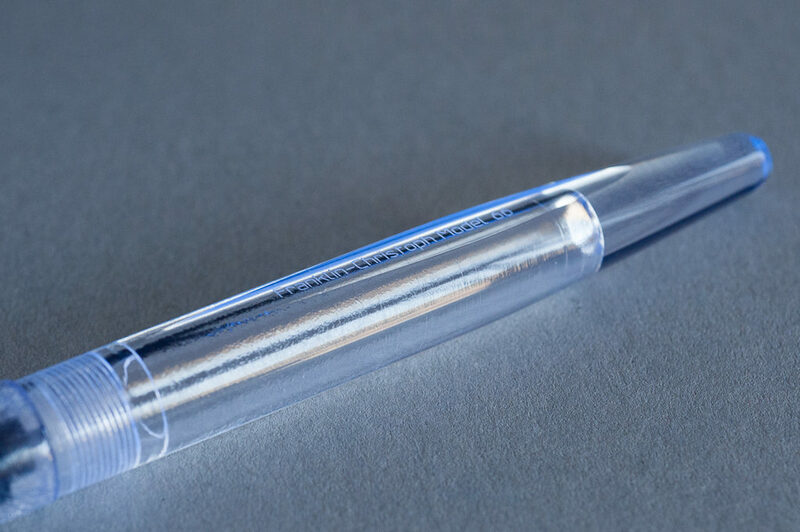 But if you detach the converter, it can also be used as an eyedropper filled pen. 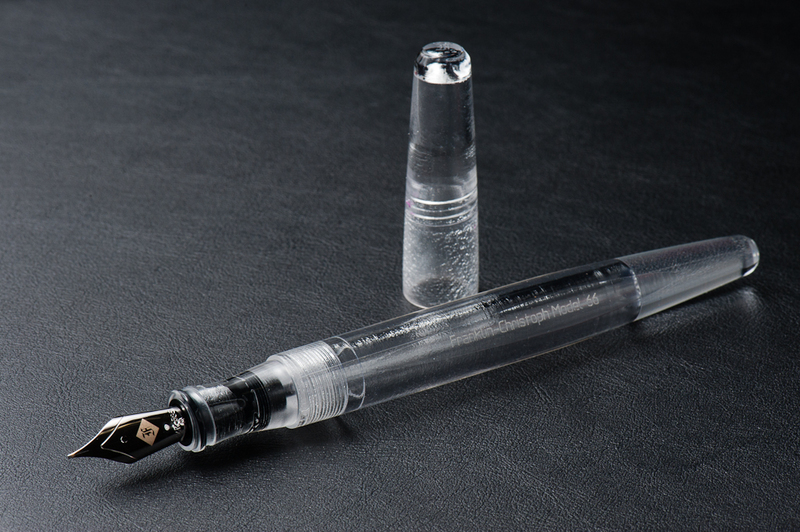 Just make sure to use a little bit of 100% silicone grease on the section-barrel threads, and the threads of the nib unit to prevent any leakage. 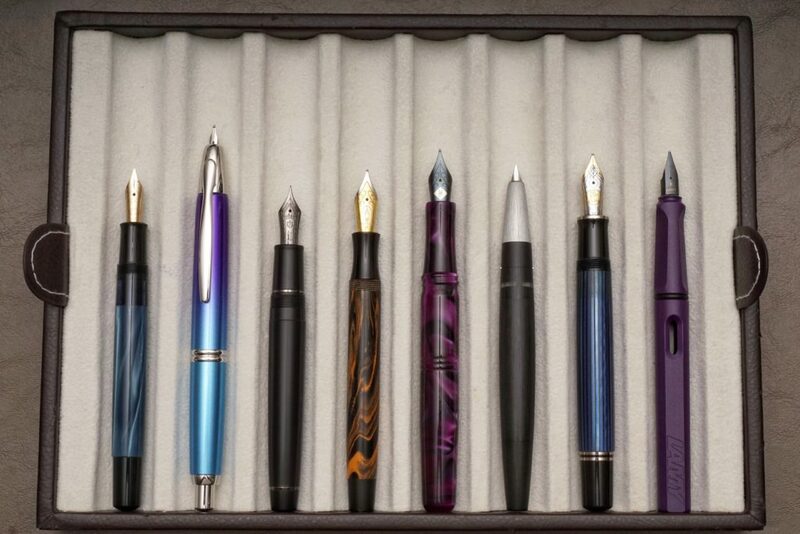 Katherine: The Model 66 takes #6 nibs — so it’s interchangeable with many nibs from F-C. 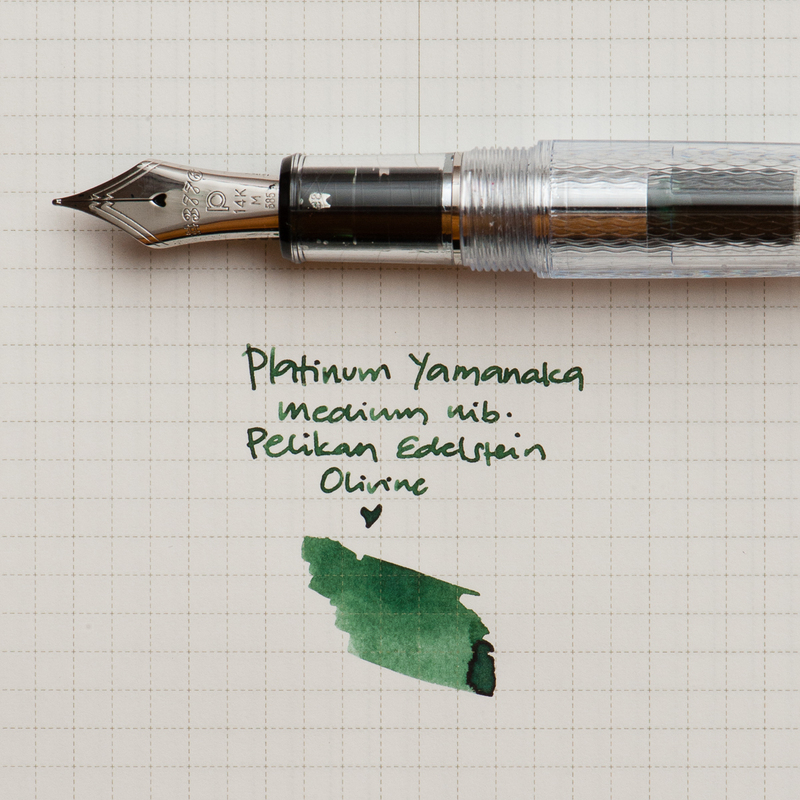 This particular nib was a surprisingly fine, but still crisp medium CI by Mike Masuyama. It’s smooth, has a little bit of spring and was overall a delight to use. I think this particular nib is finer than most Medium CIs, since I have a hard time writing with most MCIs, but had no problems with this one. 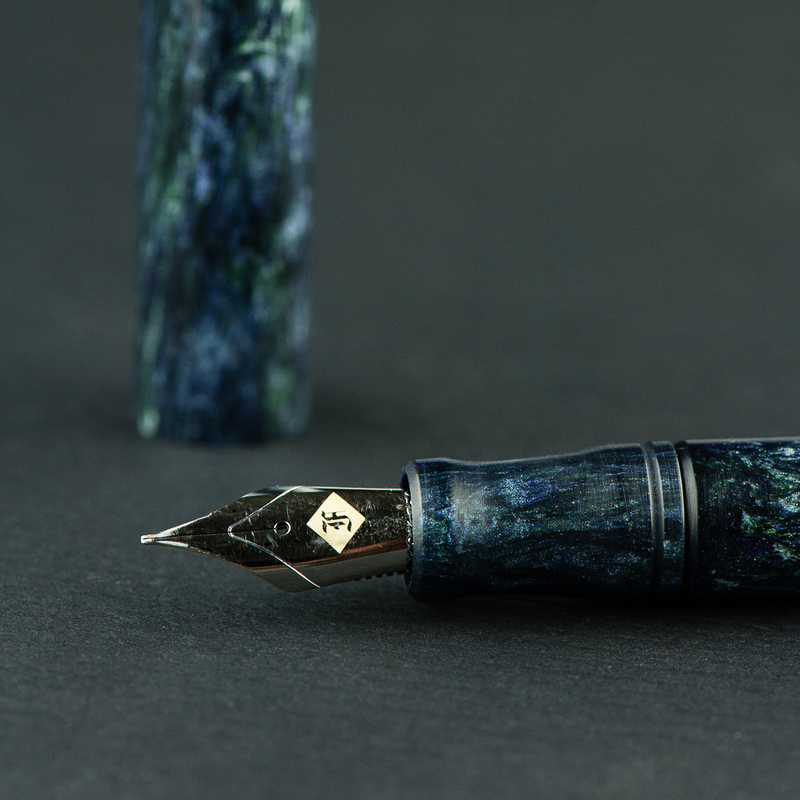 The only thing worth noting is that while I do enjoy the slight spring of the 14k nib more than the steel, it’s not worth the price difference to me. 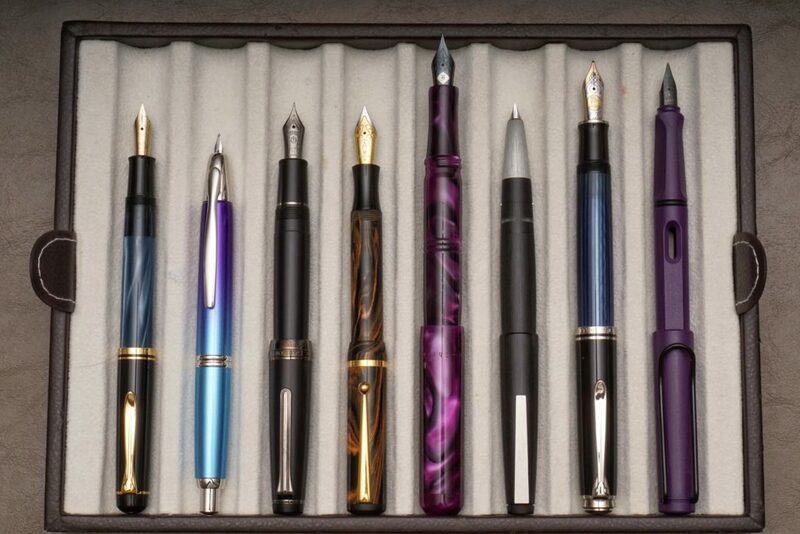 All my F-Cs have and have had (a couple have been rehomed) steel nibs. Pam: The medium cursive italic nib was wonderfully crisp and provided a well defined, crisp line. It’s a joy to write with and really shines with the Franklin-Christoph Tenebris Purpuratum, a dark and well saturated black/purple ink. This is one of the most pleasant CI nibs I have written with. This is just a great lesson that you should have your nib tuned by Jim Rouse whenever you have the chance. Franz: I asked Jim of Franklin-Christoph for a 14k medium cursive italic nib because their 14k is a little bit springier than the 18k. As Katherine mentioned, this medium CI is finer than the usual ones they have. Because I have a very light touch, I enjoyed the line width and variation this nib laid down. As long as I have it aligned to the sweet spot, it’s a smooth writer. Pam: Tiny hands handle pens alike! I, too, found the Model 66 to be slightly too long, even unposted. The length was more tolerable in the traditional tripod grip. When the pen was posted, it felt unbalanced and top heavy, especially with my “iron fist” grip; it felt like the cap would fall off in this particular grip. This is a great pen for those with hands/paws of the normal to larger persuasion or for those with smaller hands who don’t mind the added length. For the tripod grip with the CI nib, I actually prefer the length of the FC model 45 or shorter pocket models. However, the girth of the model 66 was pretty comfortable in any grip/fist formation. Franz: I wrote with this pen unposted as I found its length very well balanced and posting the cap seemed unnecessary. The cap when posted seems wobbly at first and if I try to secure it, I have visions that the cap lip might crack. Don’t worry, I think it’s durable enough and it’s probably just me. Anyway, I wrote in my journal for a good 20 minutes and my hand was quite comfortable using it. I grip the pen on the barrel right above where it meets the section. I found this very enjoyable and my thoughts just flowed as I journalled and also wrote the lyrics of a Bossa nova song. 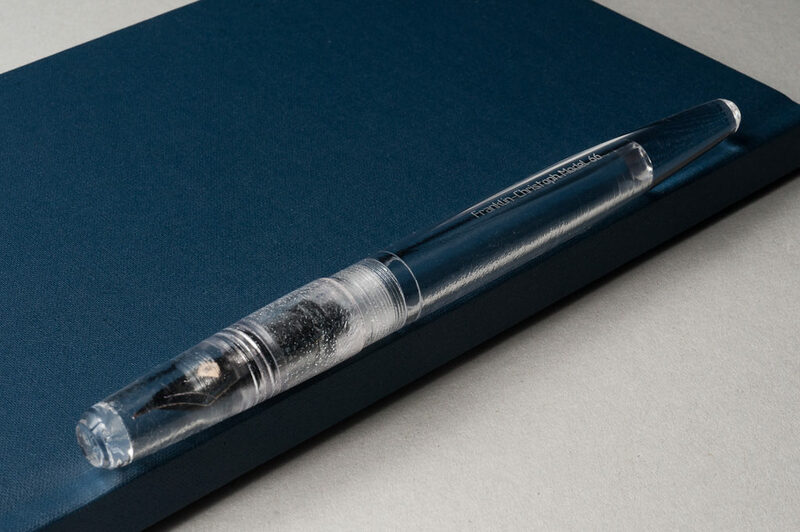 Katherine: Franklin-Christoph calls this a desk pen, and a desk pen it should be. 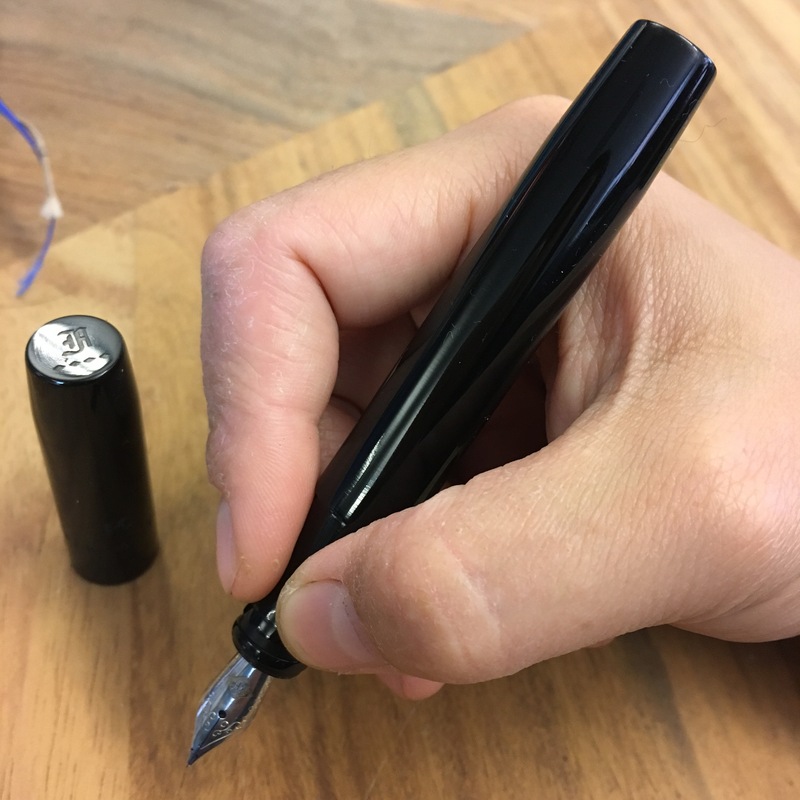 It’s a fairly long clip-less pen with a cap that can roll away (even if the body doesn’t)… Not my favorite combination on strange meeting tables. Franz: Yes. The Model 66 is a desk pen for sure but I still gave it a go and used it at work while not at my desk. I placed the pen in my jacket’s inner pocket to make it discrete. The length definitely made the pen stick out the pocket but it also allowed me to quickly grab it when I needed it. The cap unscrews with just half a turn and is quick to deploy. Half a turn! hehe.. The downside of using this clipless pen as an EDC pen is it’s more prone to roll away and fall if you set it down. And in that one day of using it at work, it almost fell once (yipes!). Also, because of it’s length, the pen sticks out of my shirt pocket unsecured which makes it prone to falling out while I’m moving around. As long as I transport the pen in a case to my office desk and use it there, it’s a great pen to use at work. Katherine: Ultimately, this pen isn’t for me. I love the way it looks, but found the length a tad unwieldy both for long writing sessions and as a work pen. I much prefer the size of the Pocket 66, which is very similar, but much shorter. The nib on this pen, as with every F-C nib I’ve tried, is superb. In the end… would I like to own this pen? Yes! It’s gorgeous. Would I use it? Probably not (so… I don’t own it). 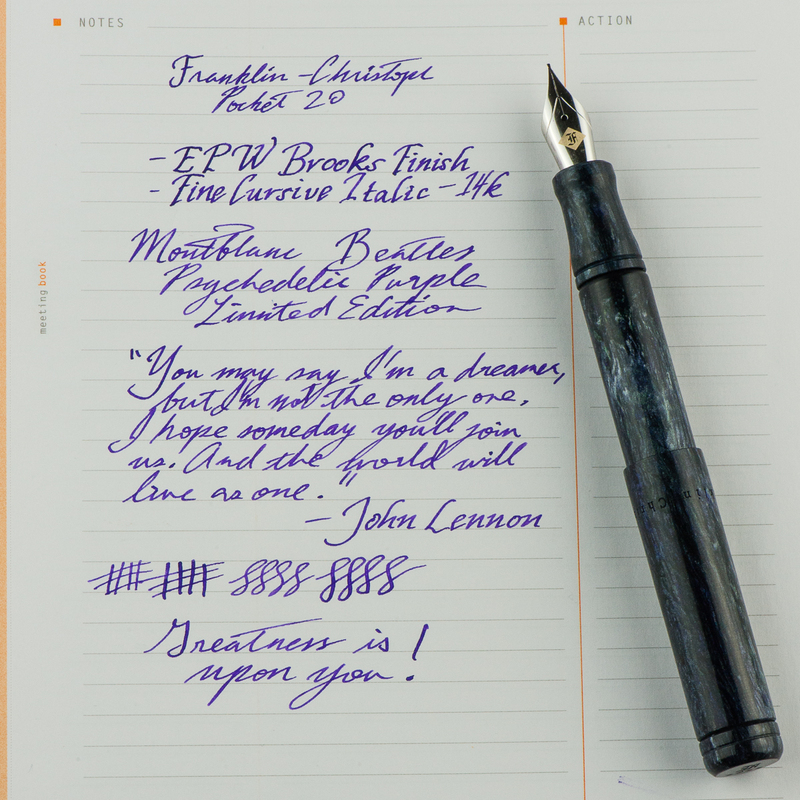 Pam: The Model 66 was probably the first design from Franklin-Christoph that caught my attention. 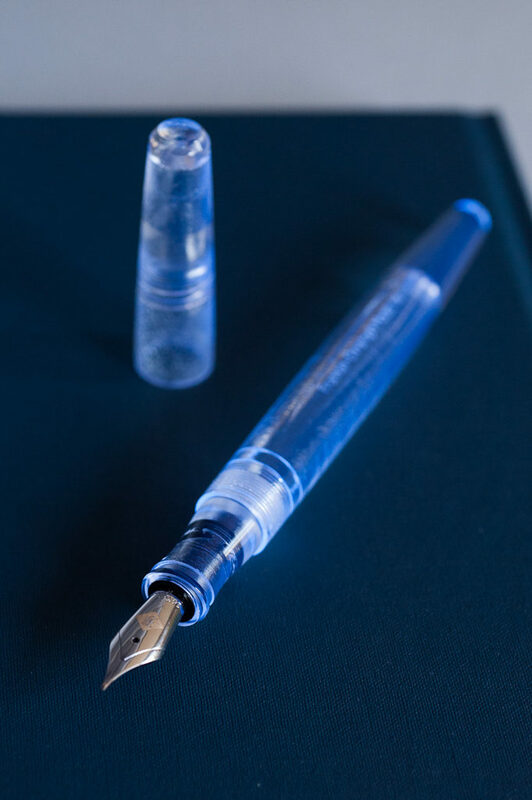 The Original Ice was the first material by Franklin-Christoph that had me stalking their website like a hyena on the Serengeti. Of course F-C has been teasing great material for the last 2 years and the Italian Ice is not exception. 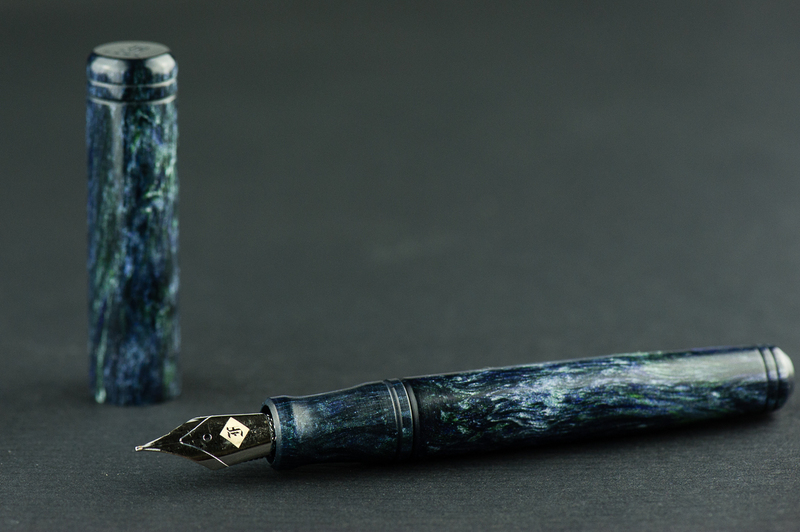 All in all, this is a great pen that is not only functional, but absolutely beautiful and unique in both design and material. 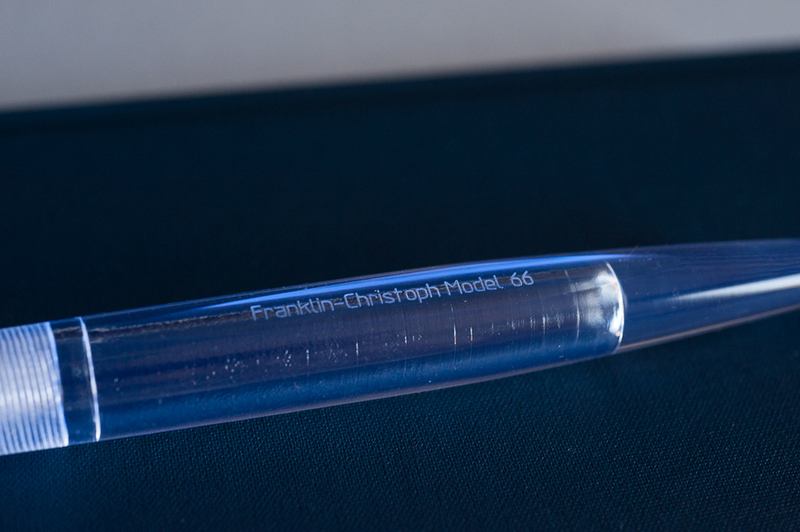 Franz: As seen in the pen comparison photos, the Franklin-Christoph Model 66 Stabilis is quite a long pen with substantial girth as well. 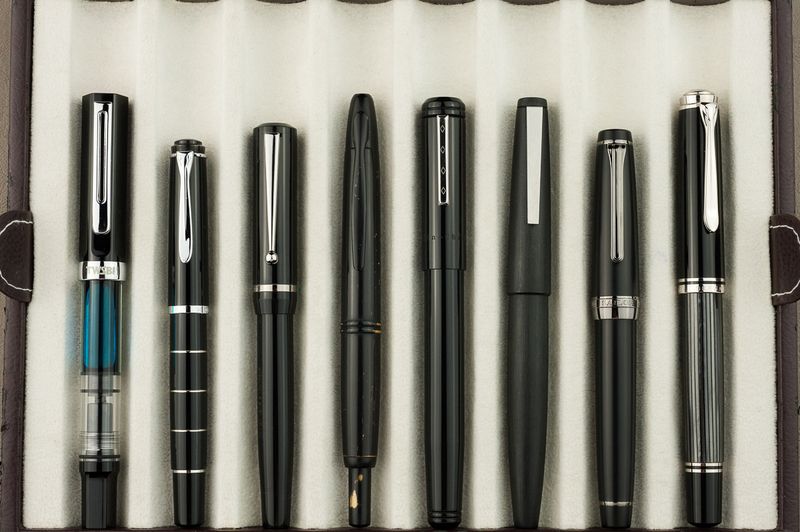 If you like larger pens, this may be for you. For small, and medium hands, try it out first for you might feel the same way as my colleagues do and opt for the pocket sized one. As for the Italian Ice finish I love it and I’m happy I got it. I will most probably end up designating this pen for work and leave it on my desk each day. This way I’ll always have a fountain pen at work. 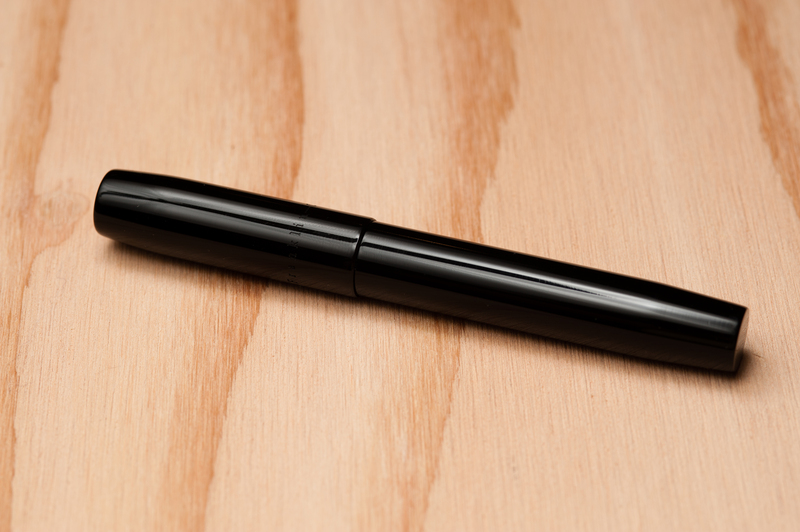 Thanks for reading our review of this pen!